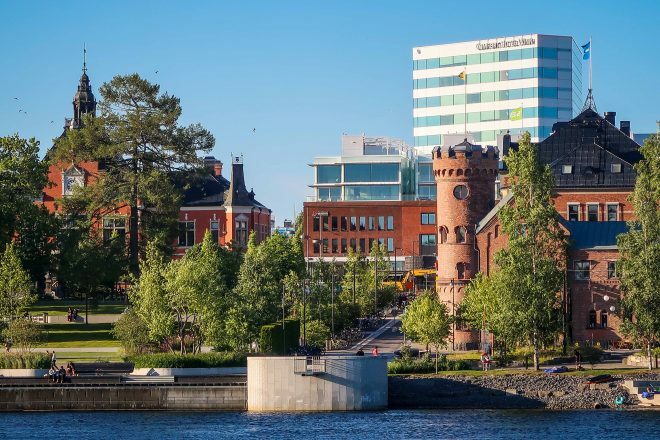 There’s a small city called Umeå in northeastern Sweden that few tourists have ever heard of or would ever care to visit. 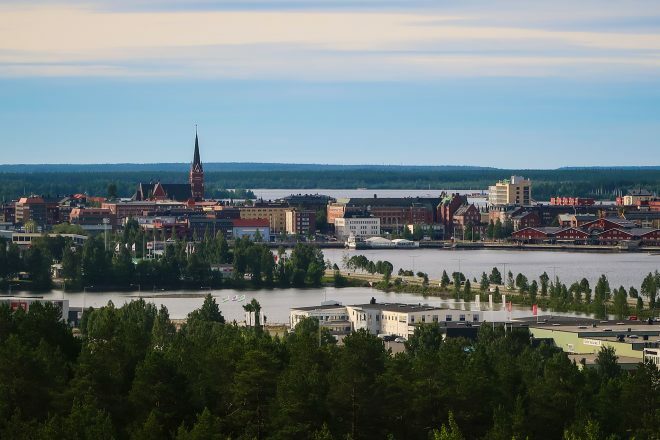 But this beautiful university town on the edge of the Ume river became the launching pad for my 2017 bike tour in Sweden, Finland and Norway; served as my home-base for the entire summer season; and was both the starting and ending location of a week-long bicycle tour I conducted with my friend Rob, his friend Doug, and a young Swedish woman named Line. 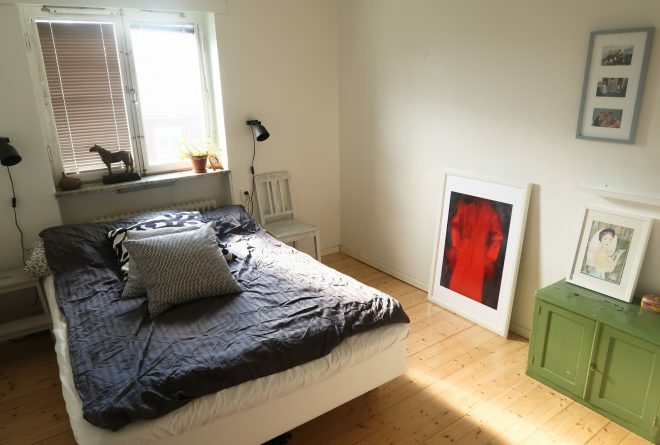 On the morning of August 5th, 2017 the four of us ( Rob, Doug, Line and myself (Darren)) gathered at the apartment I had been renting in the Haga district of Umeå and introduced ourselves to one another. 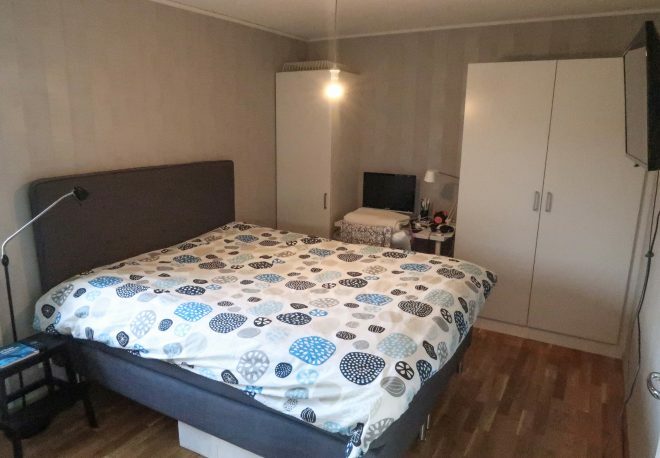 Pictured here is the apartment I rented for 40 days and nights during the summer of 2017. I spent the vast majority of my time in this apartment working from the kitchen table on my laptop computer. The bedroom was a place I really only went when it was time to go to sleep. Or if I wanted to stare out the bedroom window and observe the sun setting over the rooftops across the way. 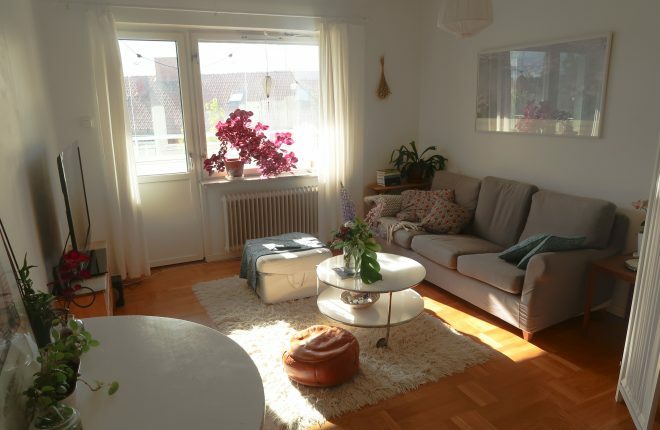 The large living room decorated with numerous plants in glass vases was rarely used during my time in Umeå, but the room came in handy once Rob and Doug arrived on August 3rd and needed a place to sleep. Rob slept on the couch and Doug slept on the floor with his sleeping pad serving as a cushion from the hard wood floor underneath. 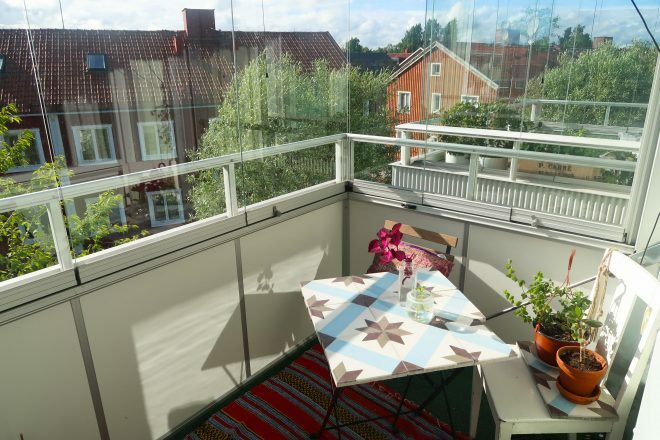 Just off the living room is a small enclosed balcony, with beautiful 180 degree views of the neighboring community. From the balcony, I could sit and work on my computer, observe the sun setting each night, and feel the cool air blow in through one of the movable glass balcony windows. 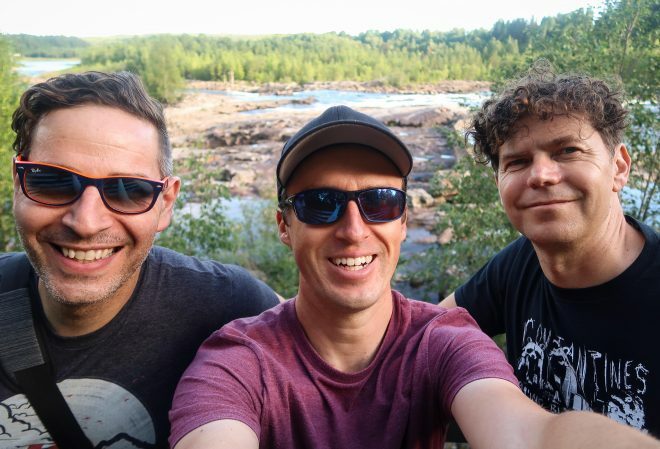 After more than a month in Umeå, Sweden on my own, Rob LoRusso and Doug Ireland arrived on the morning of August 3rd, 2017. They flew in from Canada (where they both live) and were pretty tired after their long flight to Sweden. 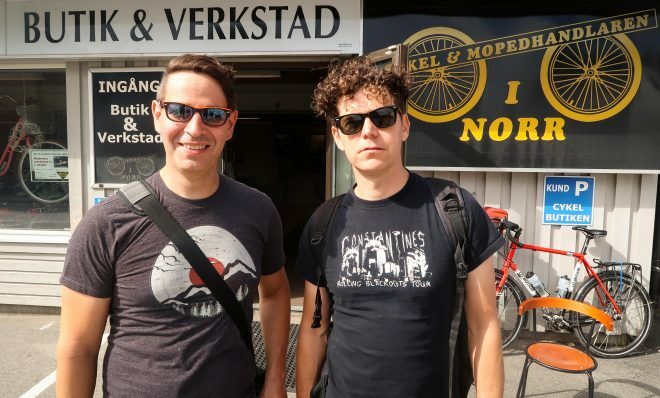 Surprisingly, however, they were still up for a bike ride during their first day in the city, so we walked to the Cykel & Mopedhandlaren i Umeå bike shop where Rob and Doug had reserved two hybrid bicycles equipped with rear racks for their week-long stay in Sweden. After the bikes were acquired, I decided to take the boys on a bike ride around the city. 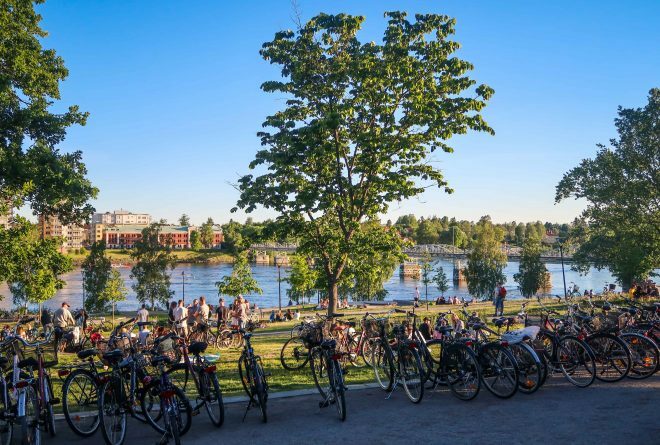 The first stop on our cycling tour of Umeå was Brokparken – one of city’s most popular and well-recognized parks. 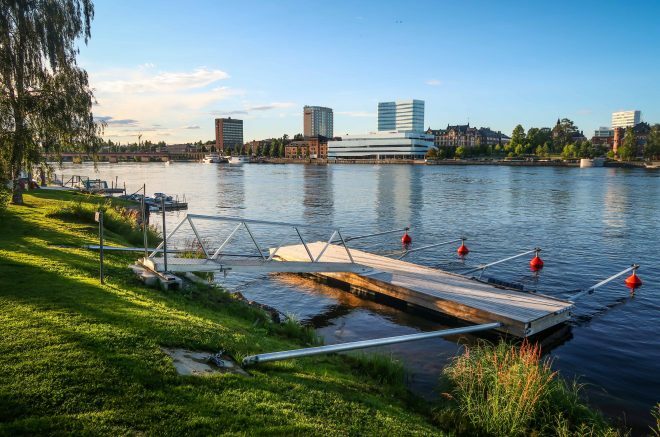 It’s an especially popular place to be on a sunny day, as the views of the river and the Bryggargatan pedestrian bridge make it an ideal location for a picnic with your friends. 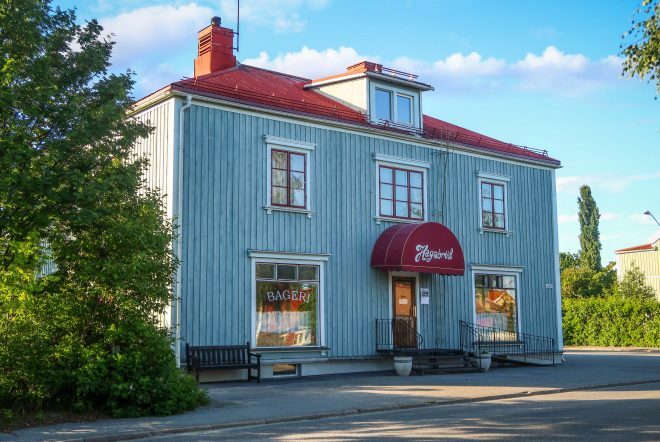 During our bike ride we passed several iconic Swedish buildings, like this old-fashioned bakery. 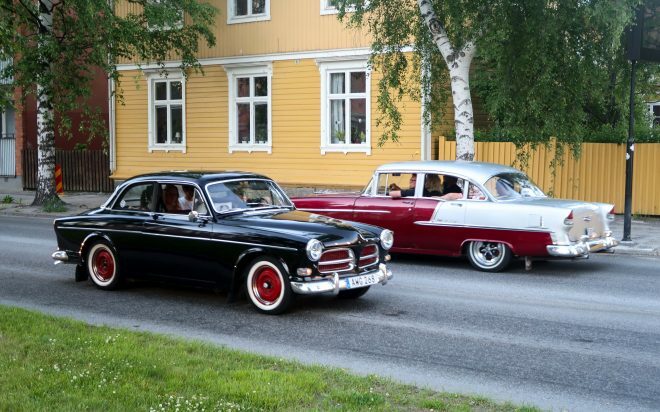 And I made sure to point out Sweden’s obsession with old, classic cars to the guys. 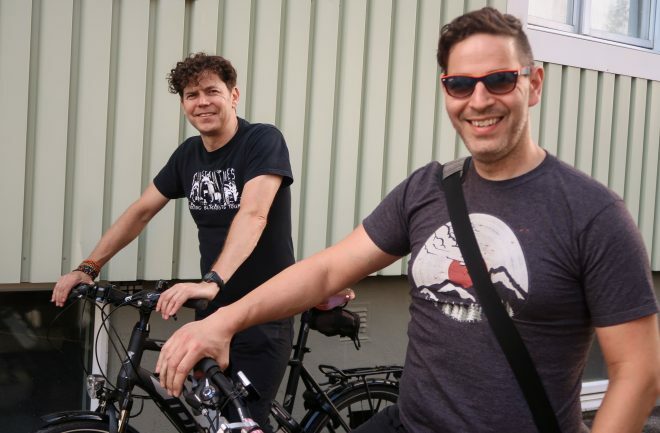 I took Rob and Doug on a loop ride around the city. We crossed from the city center over to the other wide of the river, where we were treated with spectacular riverfront views of the city. 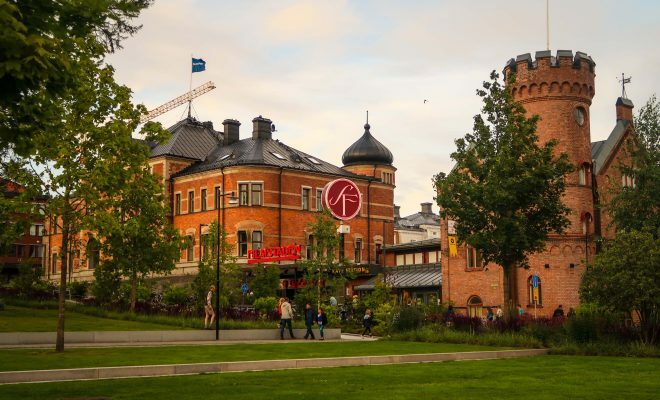 From here we could see the old town square, the Kafe Station coffee shop and the Rådhusparken. Then we cycled over to the University, zipped along the cycle path here and the circled back through the city center. 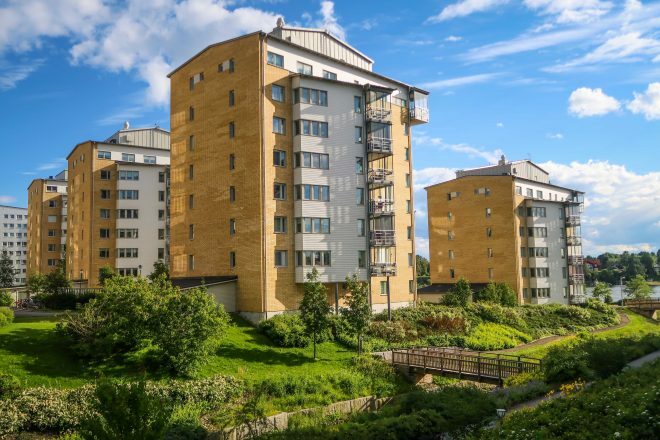 We cycled through Rådhusparken, then crossed over to the other side of the city to see the architecture of the Ryttmästaren. 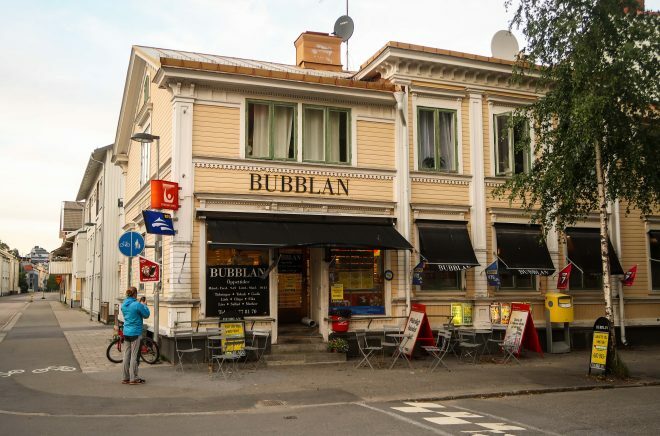 One of my favorite buildings in Umeå is the Bubblan – an old-timey candy store located on the corner of Kungsgatan and Brogatan. 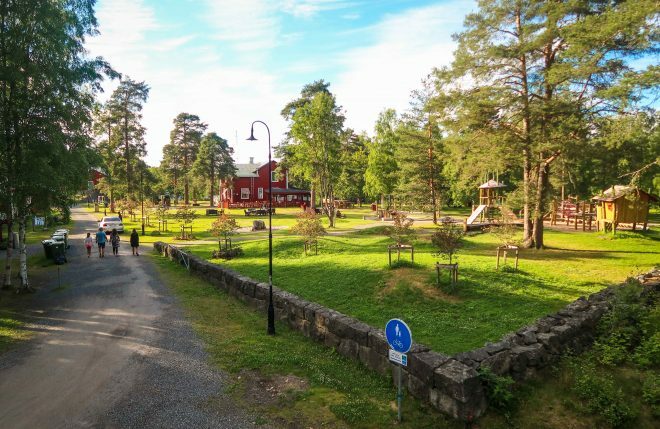 After our bike ride around the city center of Umeå, we cycled north up the river to the Arboretum Norr. 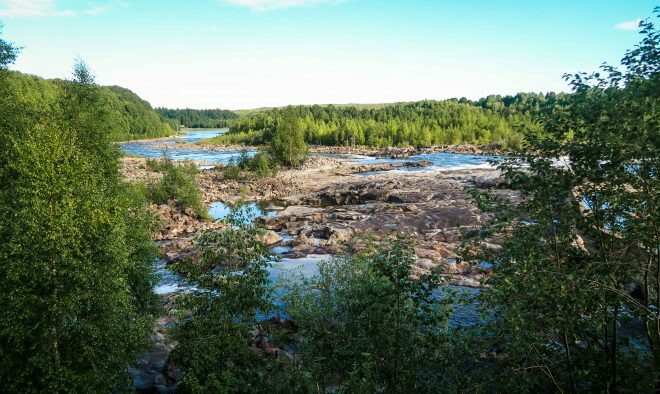 From here we were able to look out across the river and see a classic Swedish landscape of water, rocks and trees. 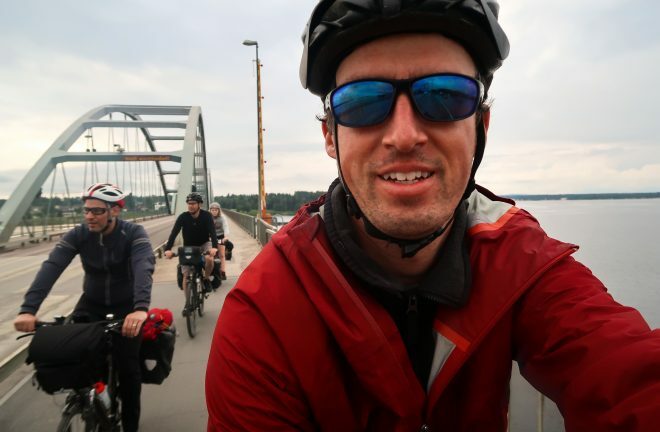 After walking around the Arboretum for a while, we crossed a narrow suspension bridge and then cycled a short distance up the road to the Stiftelsen Umeå Energicentrum. It was here that I showed Rob and Doug one of Umeå‘s best-kept secrets – an old lumber half-pipe that was once used to carry logs down the river. 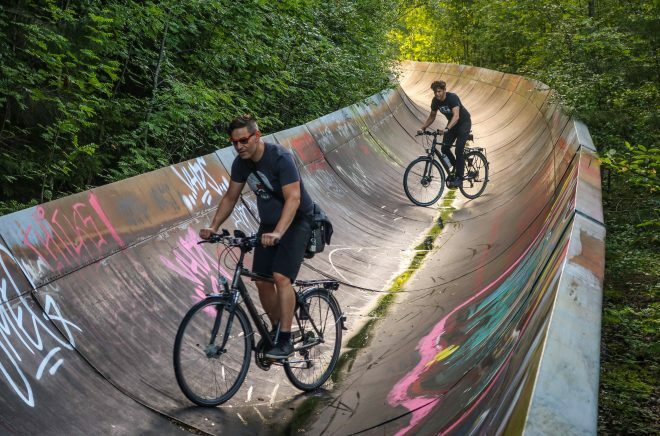 Today, a small portion of the half-pipe has been preserved and you are welcome to walk, bike or skate on the pipe. 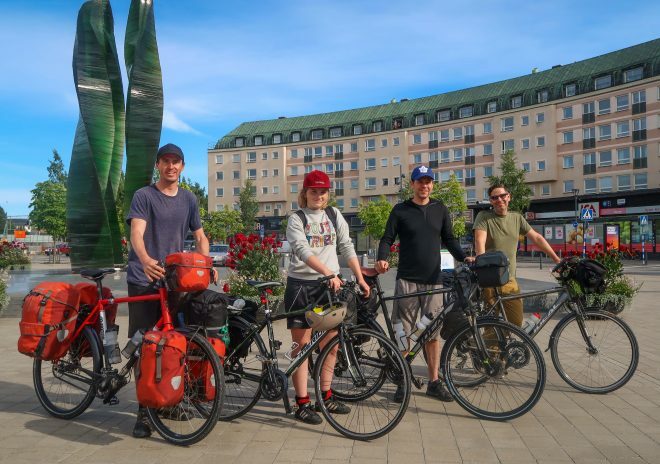 The guys enjoyed their cycling tour of Umeå, so the following day we jumped back on our bicycles and decided to explore a bit more of the city. 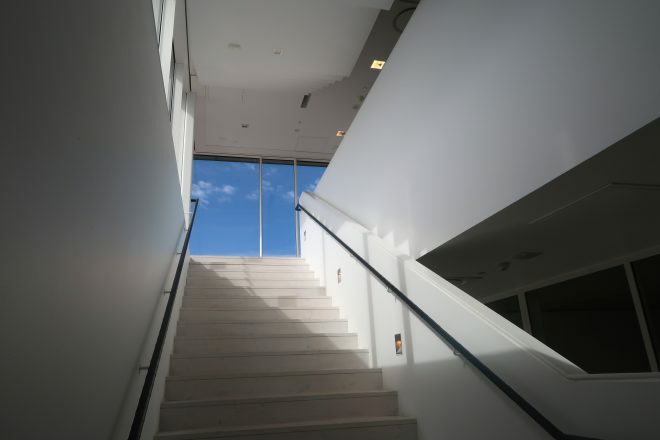 The first stop on our outing was the Västerbotten museum – a large indoor and outdoor cultural museum exhibiting both modern art and historical artifacts from Sweden’s past and present. 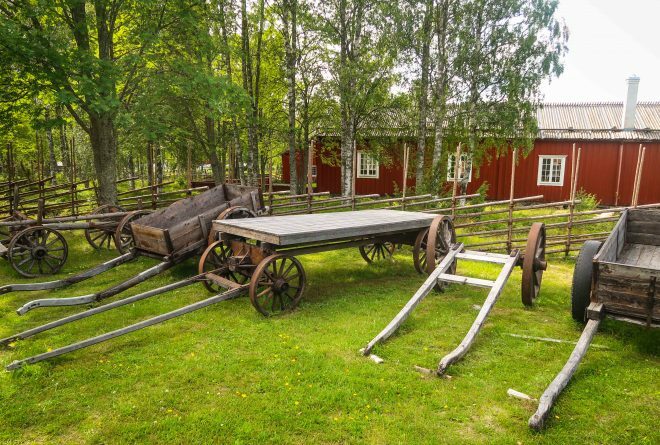 One of my favorite areas of the Västerbotten museum is where they have several Sami homes and structures on display. 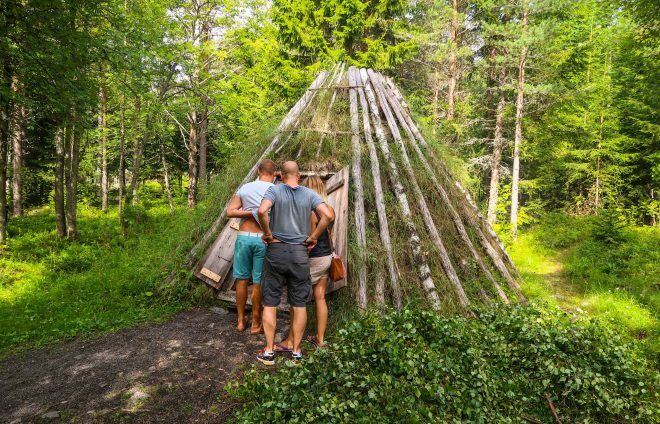 The Sami are the equivalent to the “Native Americans” in the United States or the “First Nations” in Canada. 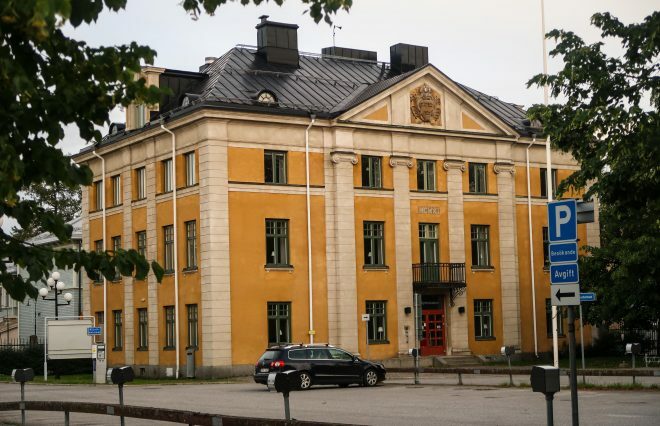 Except these people were in Sweden! 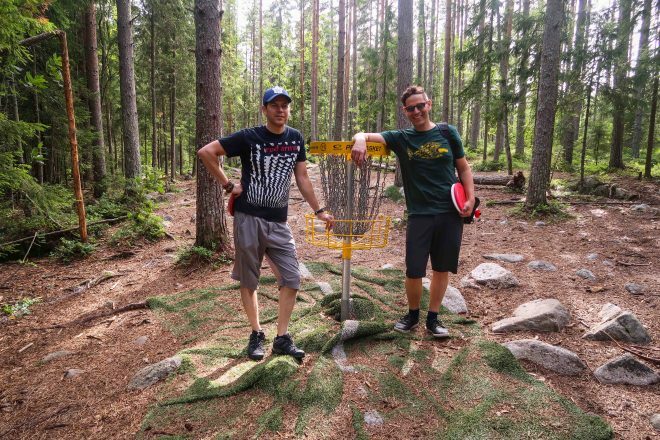 After a quick tour of the Västerbotten museum, Rob and Doug and I cycled over to the Mariehemsängarna disc golf course. Both Rob and Doug had never played before, so we certainly didn’t set any course records, but I had a lot of fun showing them how to play. 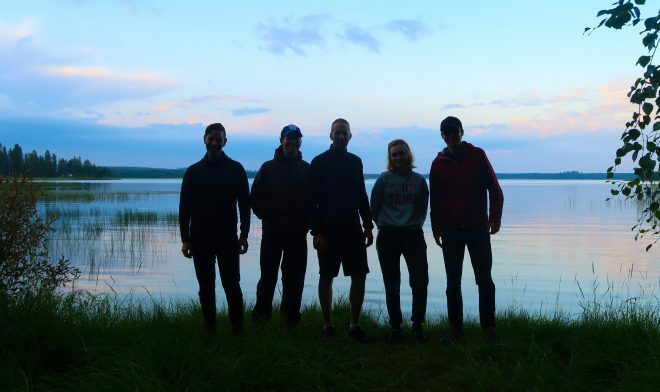 In the evening we went on a sunset bike ride around town and I took the buys out to Nydalasjön lake on the eastern edge of Umeå. 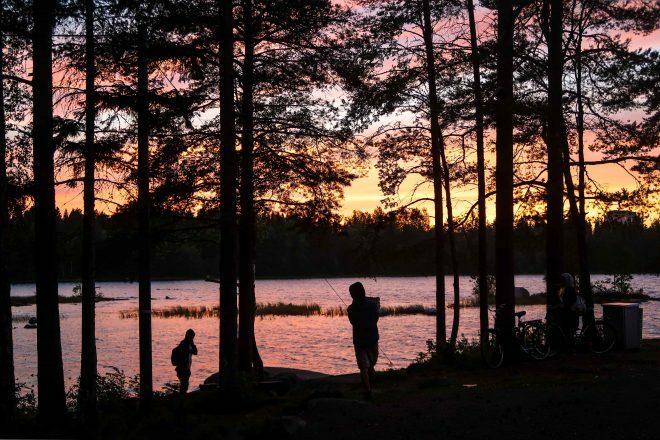 There’s a little peninsula or sorts in the center of the lake called Kärleksudden and we stopped here for a moment to observe the sunset and watch as several local teens sat around with their friends – fishing and making campfires. Finally, we darted to the city center where we observed the sun setting over the Ume river, with the city skyline silhouetted in the background. On the morning of August 5th 2017, Line Gammelli arrived in Umeå. 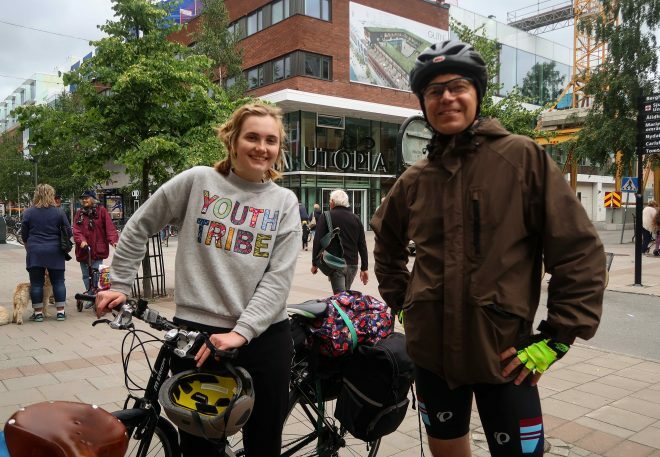 Line is a 20-year-old woman from Örebro, Sweden who reached out to me when she heard I was coming to Sweden and asked if she might be able to join me for a portion of my bike tour. I told her about this week-long bike tour I was planning to do with Rob and Doug and asked if she wanted to join us on the tour. Well, a few weeks later, Line was in Umeå and rearing to go! 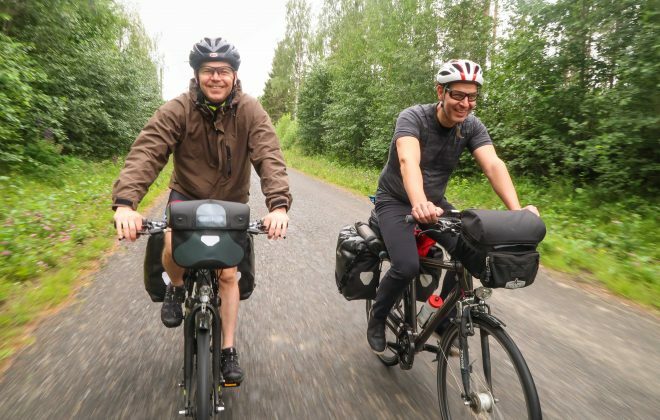 After checking out of the apartment that I had called my home for the last 40 days and nights, we loaded our bicycles with everything we’d need for the journey ahead and began cycling north out of the city center. 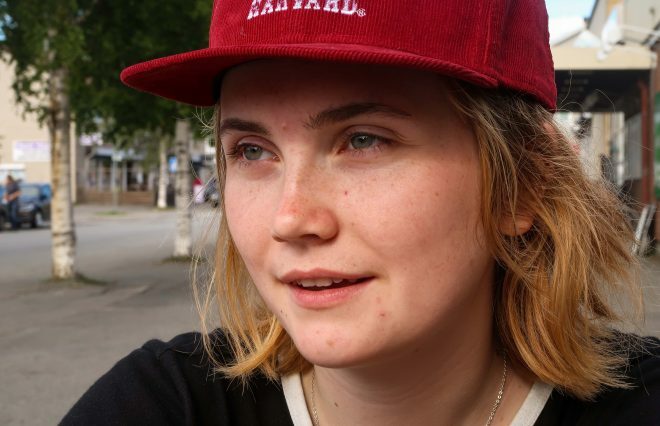 Line had traveled by more than 10 hours on both bus and train the night before in order to get to Umeå in time for the start of the tour, so she was tired right from the get go. Rob and Doug were both still recovering from jet-lag after their long flight from Canada. And I was tired just because I had to wake up before noon. So, we were all pretty tired during our first day on the road. 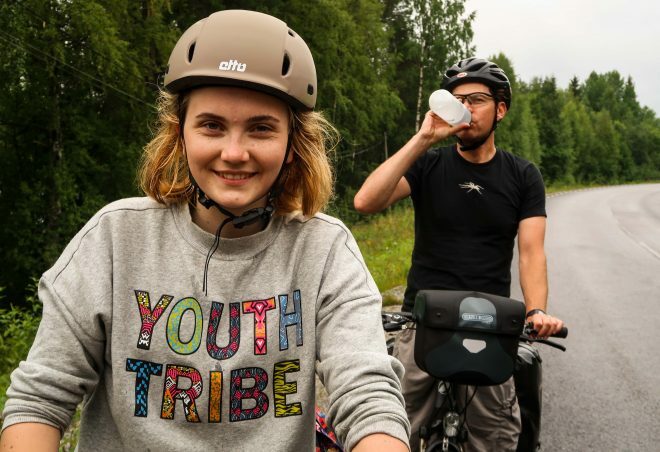 Even though we were all tired, we needed to cycle at least 60 kilometers that first day if we were going to keep on schedule, so we cycled north and stopped frequently to rest, eat and re-hydrate. 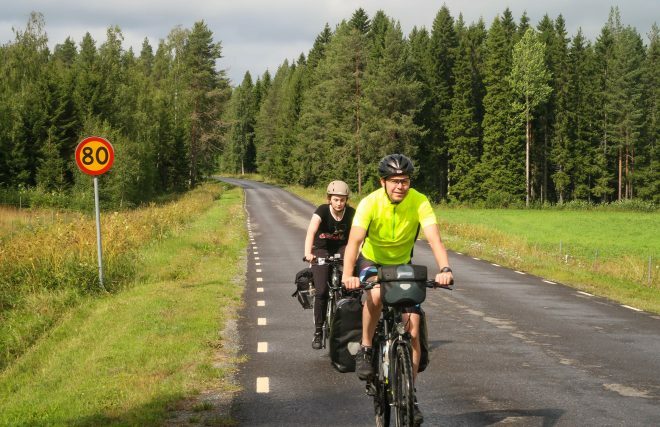 We spent the entire day cycling on 364, which is a small highway two-lane highway that runs the entire distance from Umeå to Skellefteå, Sweden. 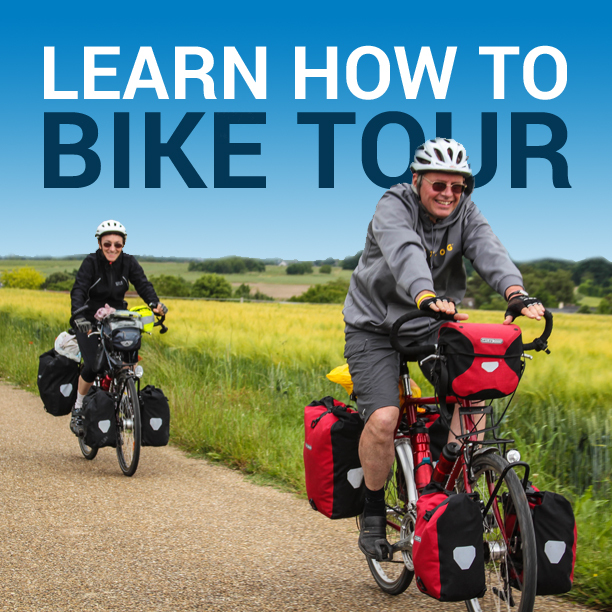 I’ve never actually done a self-supported bicycle tour with three other people before, so I was a little nervous about how that was going to work. I reminded the group that we should either all cycle together in one big, tight group… or we should split up and cycle in two smaller groups, with a large gap in-between the both of us. This way, if passing vehicles want to get around us, they have space to zip past and then pull back into the lane, without crashing into one of us on our bicycles. With this in mind, we sometimes rode together as a tight group of four – drafting off of one another whenever possible. Othertimes, we’d split up and Rob and Doug would ride together for a while, while Line and I would cycle together for a bit. Othertimes, Line and Doug ride together and Rob and I cycled as a pair. After we had completed the required 60 kilometers for the day, we began looking for a place to camp for the evening. We were all extremely tired! 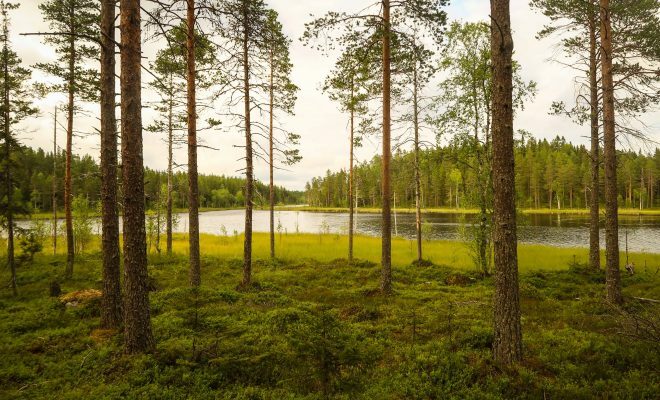 We found an idyllic tree-lined forest on the edge of a gently-flowing river where we could have camped, but the spot was already occupied by a couple in a large RV. 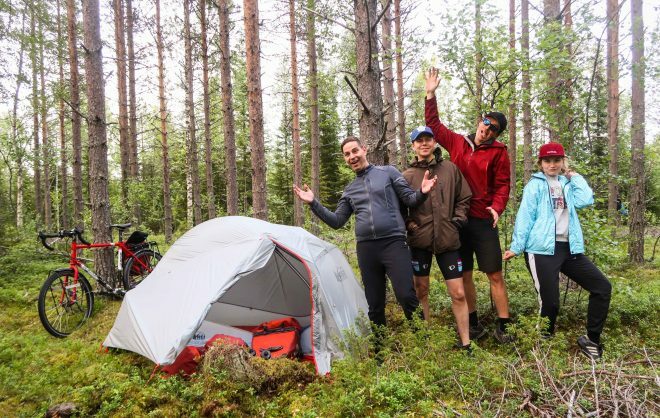 So, we pressed on down the road and ending up pitching our tents in a random flat spot in the forest – located just a short distance down a remote dirt road. Spirits were high after our tents had been erected, but the mosquitoes were swarming and we were all pretty tired. 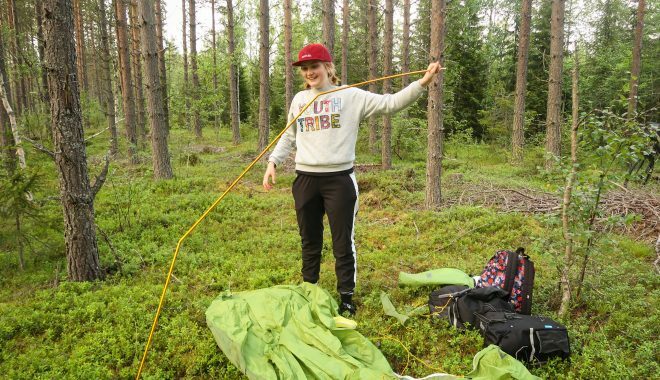 While it would have been great to have made a campfire and sit around it late into the evening, we decided to instead climb inside our individual tents, eat some dinner very quickly and then promptly go to sleep. We needed to rest for the long day we knew was ahead of us the following day! We got a late start the following morning, but we eventually managed to pack up our bicycles and hit the road. We cycled a short distance on the dirt road we had entered in on the previous night and then continued north up the 364. 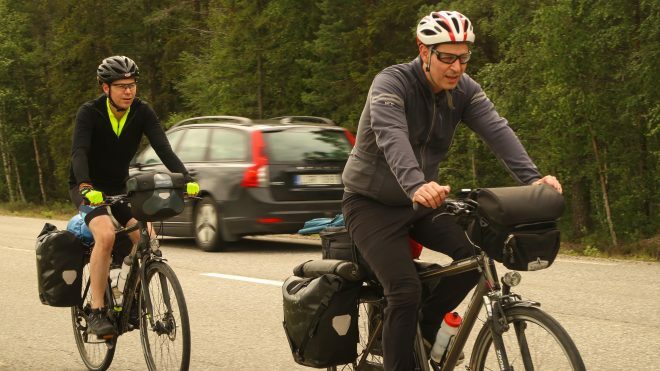 By this time in the tour, Line was really getting the hang of bike touring. 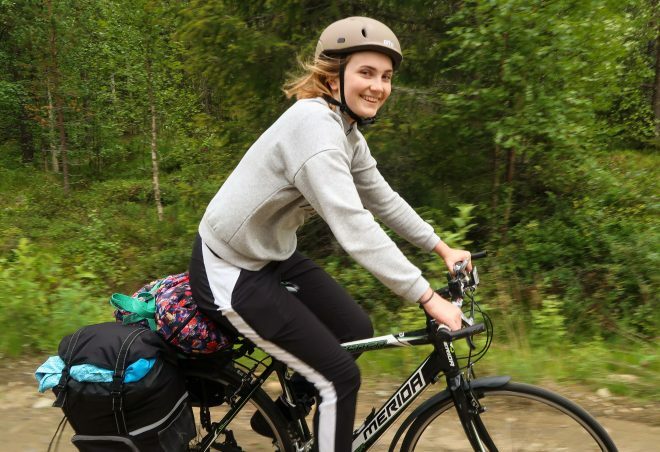 Prior to this trip, Line had only done a short 2-day bike tour on her own. 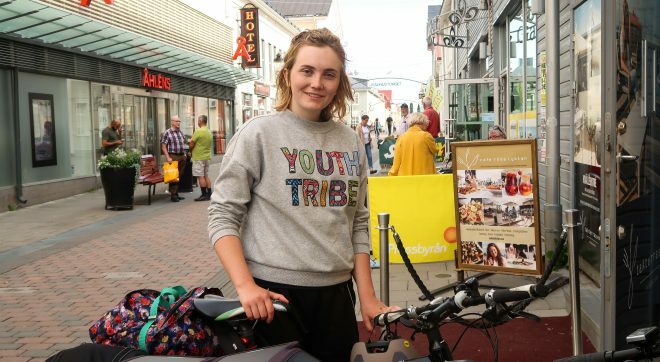 She had planned to cycle for more than two days, but things didn’t go exactly to plan and she decided to quit after less than 48 hours on the road. 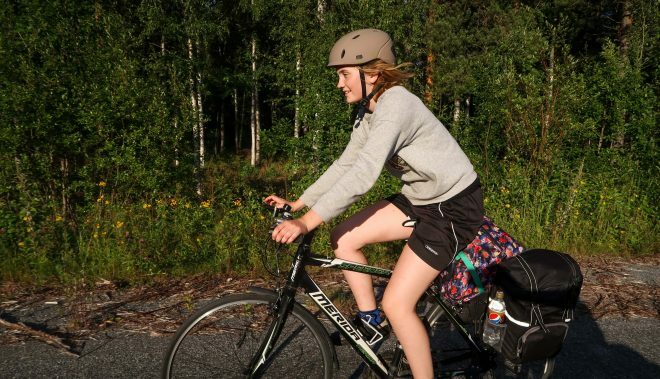 So, this week-long bike tour with in northern Sweden was Line’s opportunity to redeem herself. And wow did she do a great job! Line was a pro on the bike. 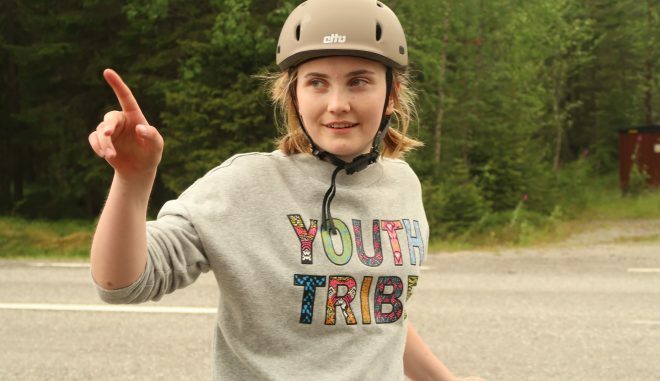 Her form was great, she was strong on the hills, we never once had to wait for her, and she never complained. She was a great bicycle touring travel companion! This was also Doug’s first bicycle tour. 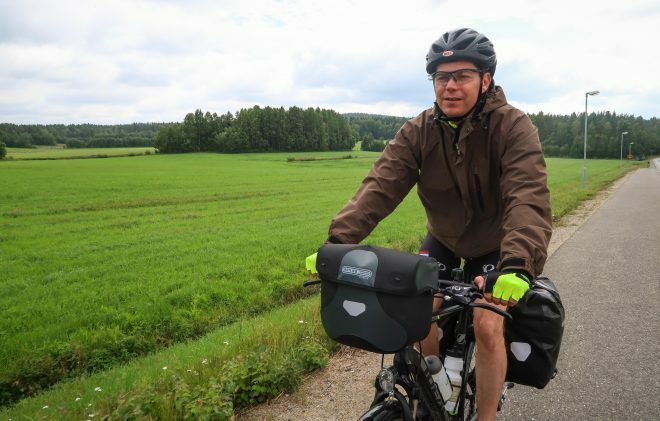 Doug, like Line, had done a considerable amount of cycling in his life before this moment, but had never done an overnight bike tour like the kind we were on here in northern Sweden. Like Line, Doug performed fantastically. He may have been a bit slow to pack up in the morning, but once he got going he was a joy to be around. 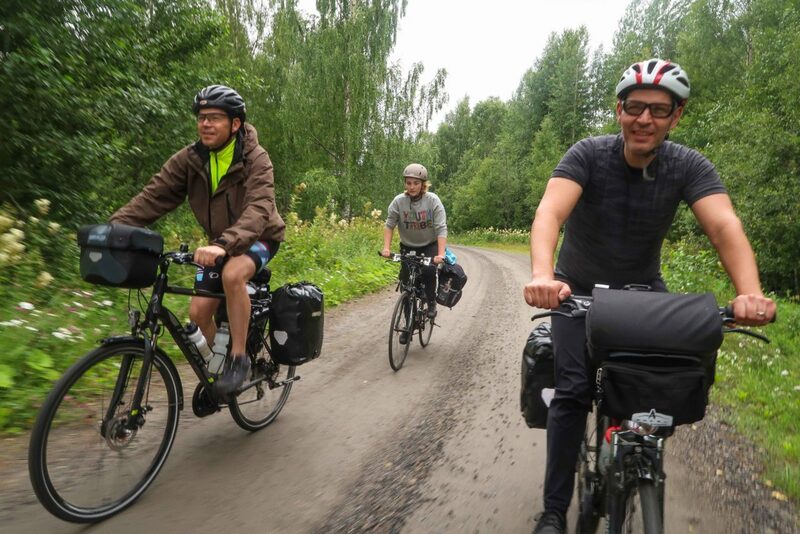 Cycling on the 364 was not the most memorable part of our bicycle touring expedition, but it was a good road to take because it took us in a relatively straight line from Umeå to the center of Skellefteå, where I had arranged for us to stay at the family home of one of my Bicycle Touring Pro readers named Mikael. 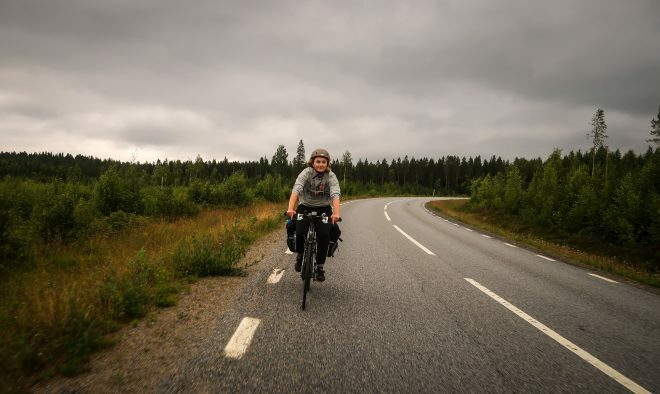 In order to reach Mikael’s house, we had to cycle about 80 kilometers on this particular day. And because we got such a late start, we didn’t arrive at Mikael’s home until nearly 6:00 PM. 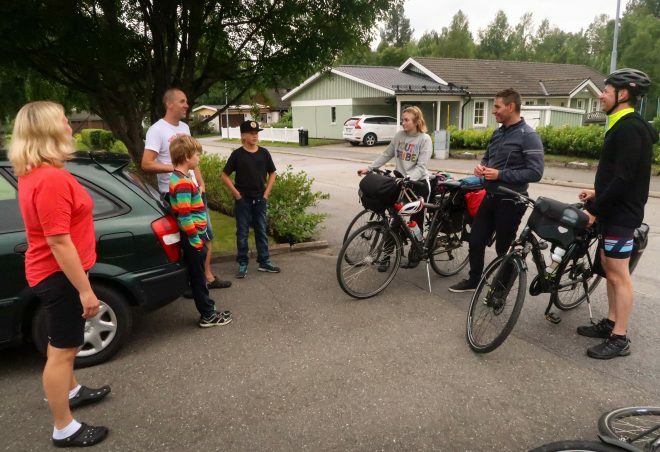 When we arrived, we were greeted by Michael, his wife Malin and their three sons – Melwin (12), Malte (9), and Mio (4). 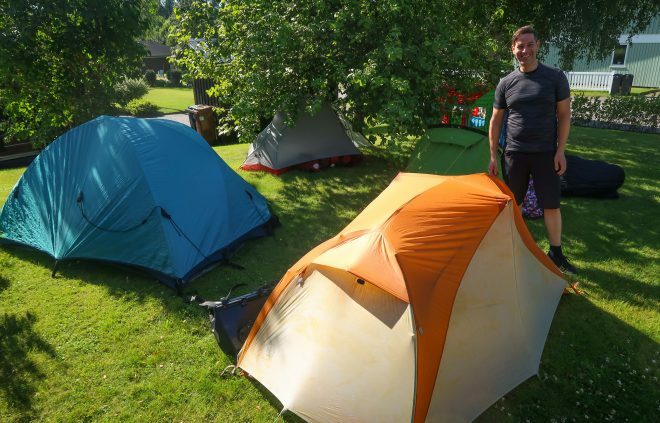 After a brief introduction to Mikael and his family, we set up our tents in the family’s front yard. Then we went inside the house to shower and get ready for dinner. 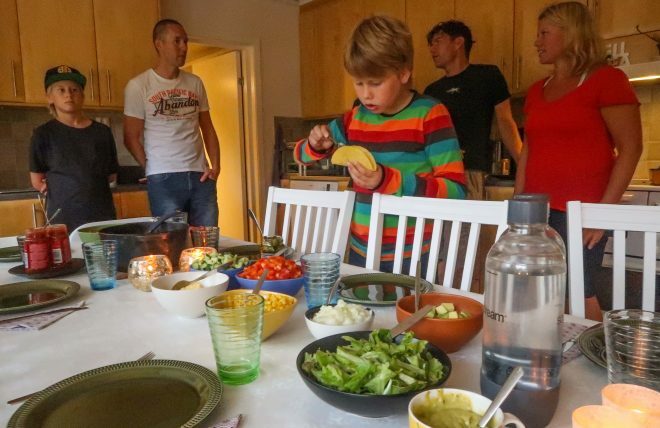 Malin had prepared a huge Mexican-style meal for the four of us, and they had waited to eat until we had arrived, so the boys (and us too) were absolutely starving. 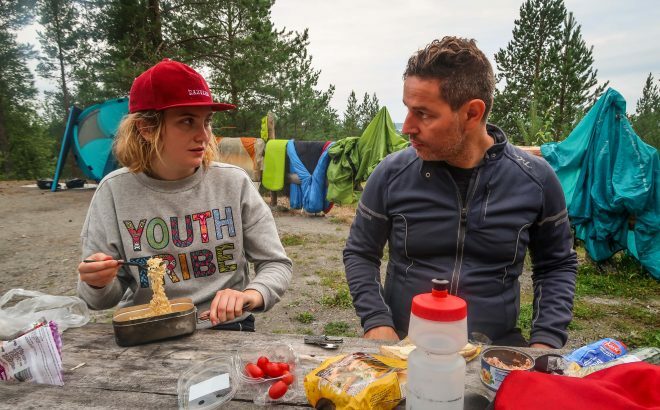 Mexican food is my favorite, and I think Mikael knew this, so he and Malin made an excellent choice in deciding to serve this particular meal to our bike touring party. The best part of the meal was Malin’s strawberry dessert (not pictured here). Oh, man, was it good! The 6th member of Mikael’s family was his pet cat, Blixten – a name which means “Lightning” if translated to English. 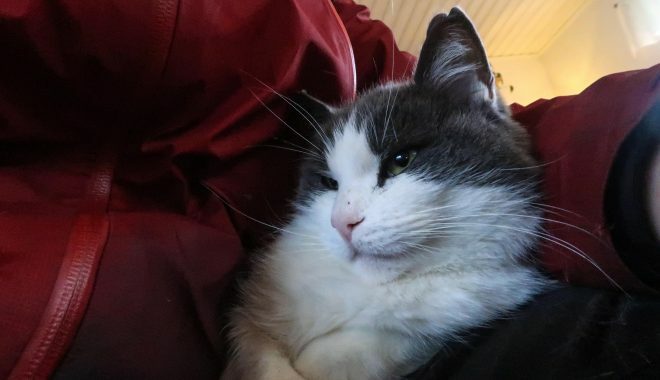 He was a large, friendly cat that was quick to sit on my lap and cover me in hair. 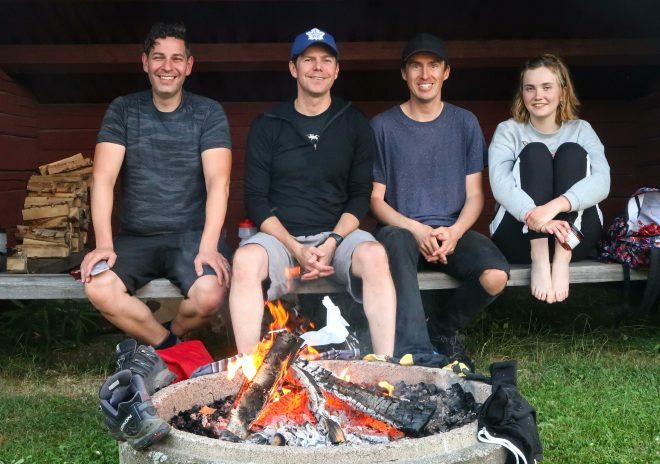 We stayed up late talking to Mikael and Malin that evening, but it was seriously one of, if not, the best part of our week-long bicycle tour, so we enjoyed every moment of it. 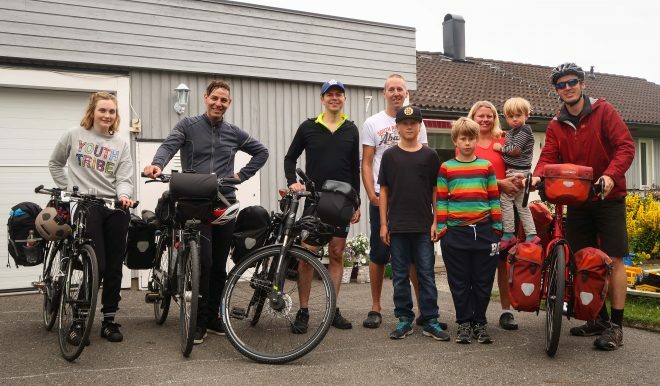 After a good night’s rest, we packed up our bicycles, said goodbye to the family, and then began pedaling west out of Skellefteå. 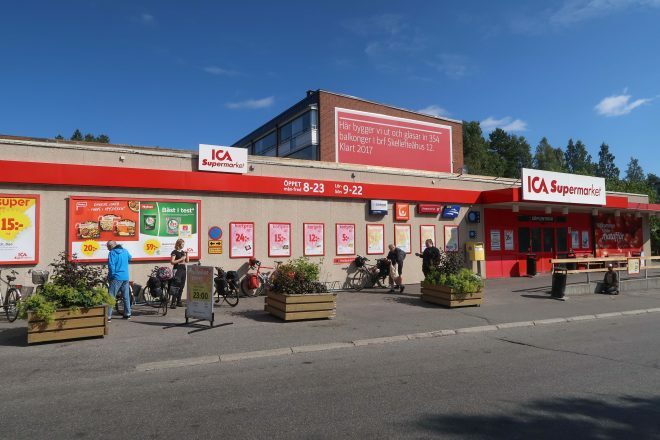 Before leaving town, we stocked up on food and water at the ICA supermarket. 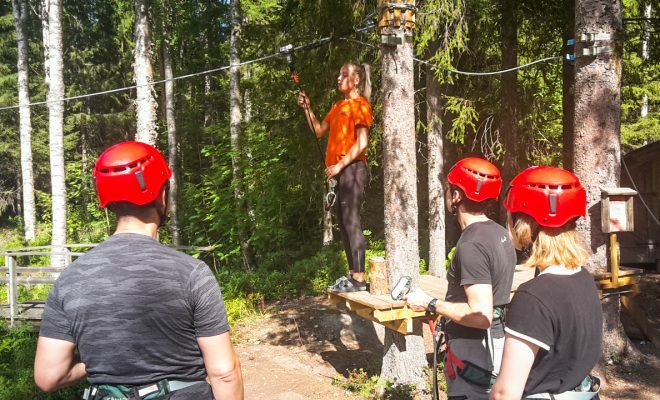 Then we traveled a short 15 kilometers across the city to the Skellefteå Adventurepark – a rope and zip-line course located high in the trees. Mikael had suggested we visit this place while we were in town, and I thought it sounded like a lot of fun – as did the other members of my group. When Melwin and Malte heard that we were going to the Adventurepark, they wanted to come too. 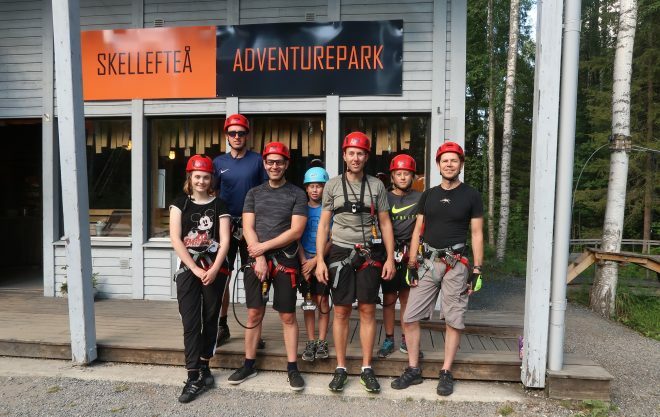 And since Mikael and Malin had been telling the kids all summer long that they could go to the park, they saw this as their opportunity to finally go. 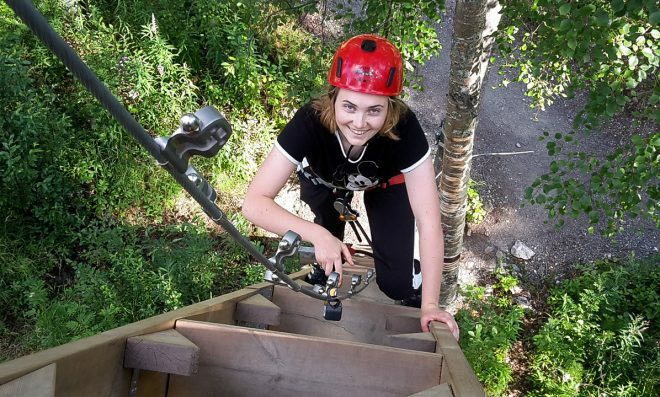 A gorgeous young woman named Martina instructed us on how to wear our harnesses and how to navigate our way through the course that had been constructed in the forest surrounding the Adventurepark’s main office. She tested us on a mini zip-line and then let us on our own to make our way through the trees. There were all kinds of different obstacles we had to make our way through. There were nets and ropes and ladders and all sorts of wild things we had to climb, balance on and travel across. 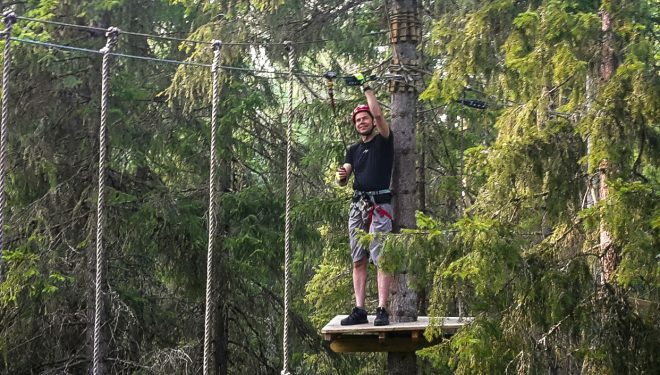 Rob admitted to having a small fear of heights, but he did incredibly well once he got up there in the trees. 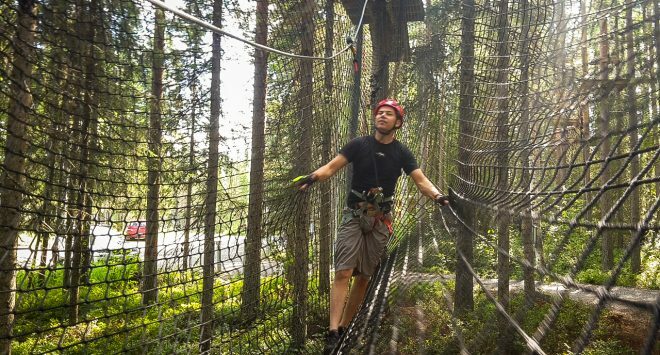 Once he realized he was safe with the zip-line attached to his harness, he knew there was no way he could really hurt himself or fall to his death, so he started enjoying the experience, rather than being afraid of it. 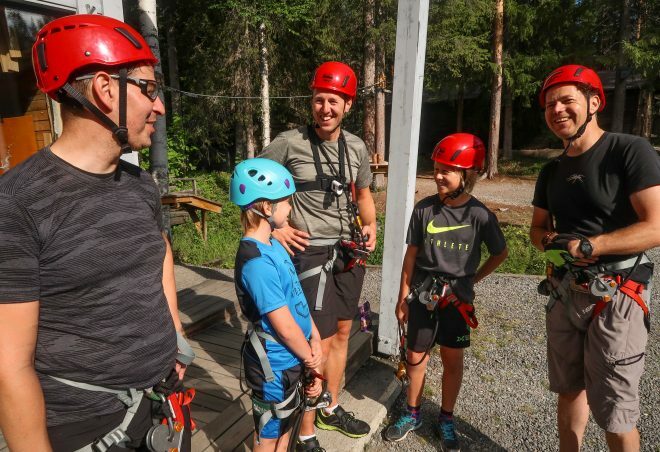 Our day at the Adventure Park city Mikael, Melwin and Malte was another highlight of our bike tour in northern Sweden. 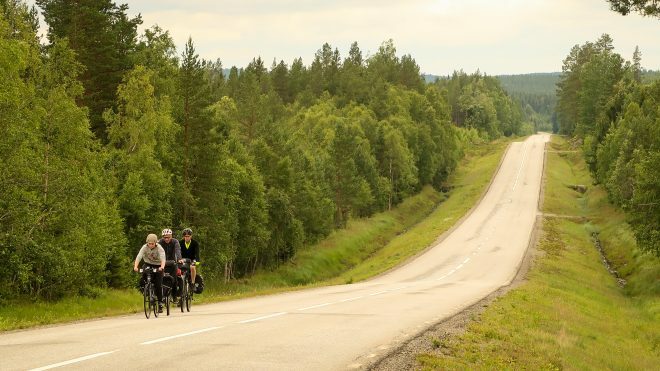 It had absolutely nothing to do with cycling, but off-the bike experiences like this are what make the overall bicycle touring experience so memorable. 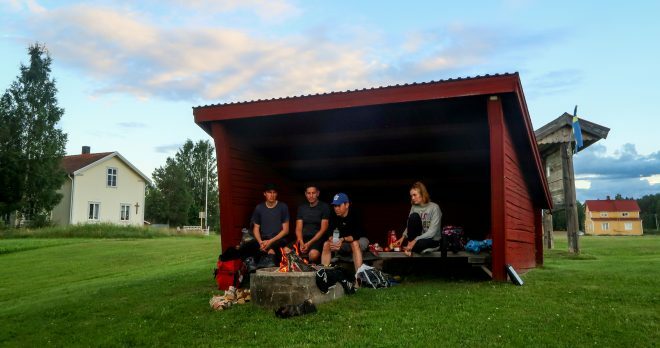 It was already pretty late by the time we finished at the Skellefteå Adventurepark, so we decided to cycle just a short distance down the road to a nearby lake where Mikael knew there was a shelter and a fire pit. 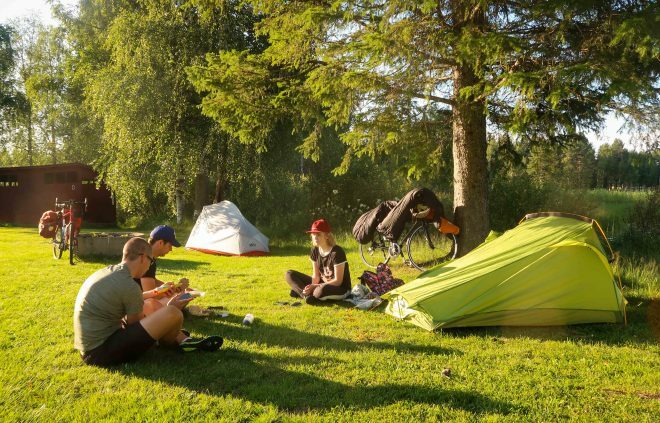 This idyllic lakeside hangout turned out to be an incredible camping spot for us bicycle travelers. 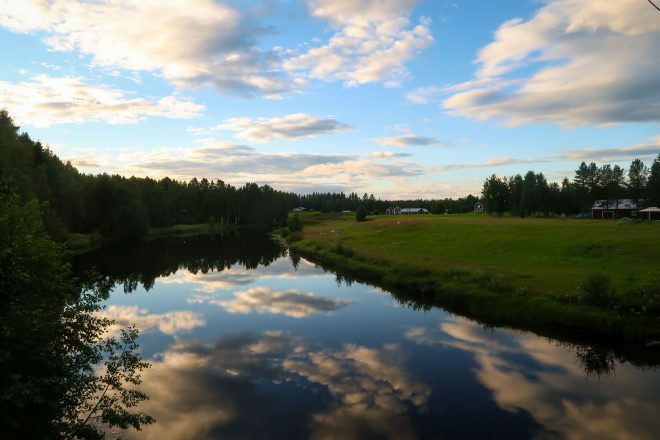 We pitched our tents on a large, grassy area next to the southern edge of Varuträsket lake. We ate some dinner and then spent the rest of the night sitting around the campfire, talking and telling stories. Mikael stayed with us for the entire evening too, which was great, because we got to spend some more time with him. Finally, the sun began to set. Mikael said goodbye and we all climbed inside our tents and went to sleep. 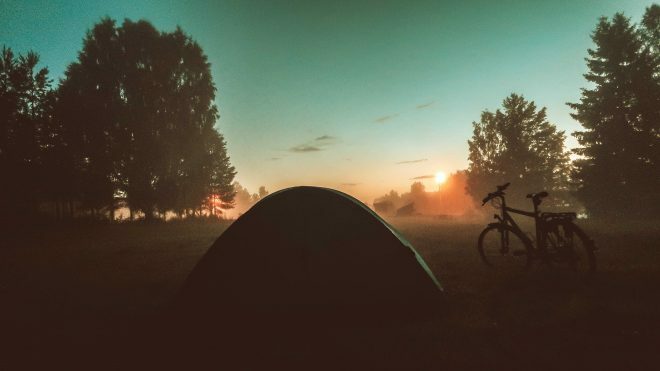 The following morning we woke up, packed up our bicycles and prepared to hit the road. We planned to cycle only 50 kilometers or so on this particular day, but by the time our day had come to an end, we had cycled closed to 90 kilometers. This particular day also turned out to be one of my favorite days on the entire bike tour! 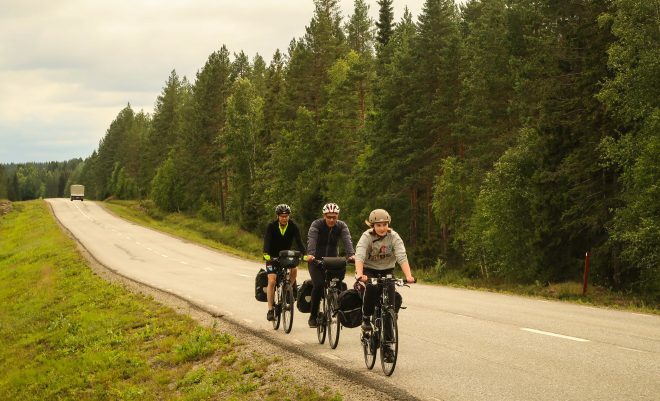 Instead of cycling 15 kilometers back to Skellefteå and then heading north from there up the coast to the city of Piteå, we decided to take a more inland route, which took us through a scenic forest and then dropped us out on Jörnsvägen road. 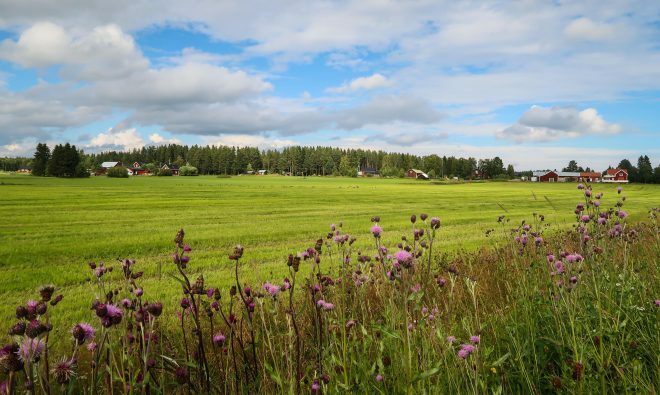 From here, we turned to the east and began making our way toward the tiny town of Kåge. During our morning bike ride, we ran into an old man dressed in work-wear sitting by the edge of the road. We stopped and spoke with the man for a minute and we were thankful to have Line along, as the old man didn’t speak much English. 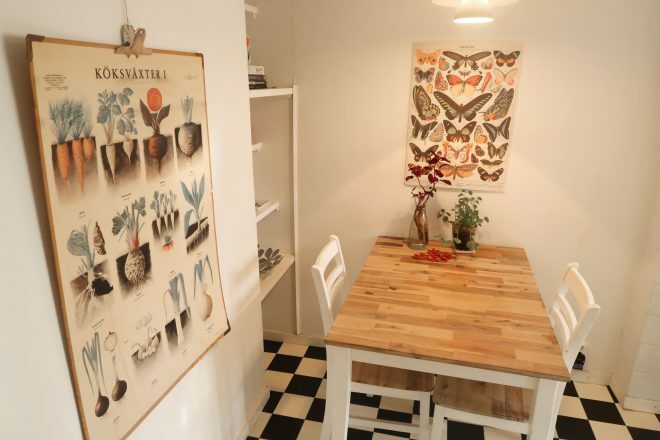 This wouldn’t be the last time Line’s Swedish language skills would come in handy on our bike tour! 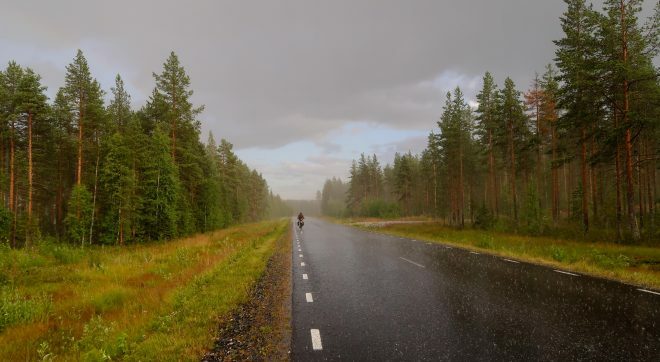 The weather on our bike tour across northern Sweden wasn’t always the best. 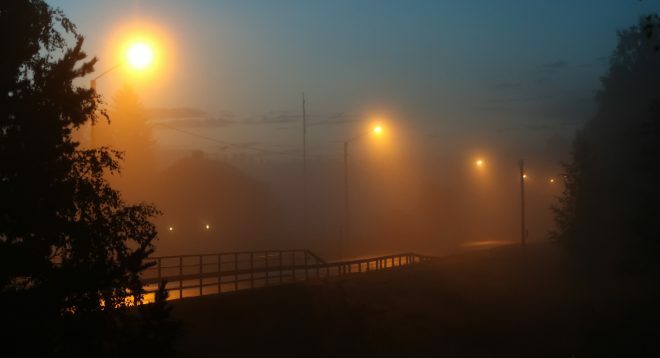 Most days it was dark and overcast – threatening rain several times each day. On this particular day, the weather seemed to change constantly. One moment it was dark and cloudy, and the next moment the sun was shining and it was quite hot. 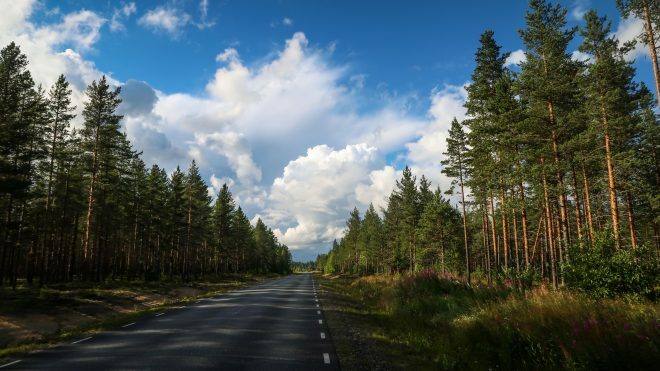 We’d stop to put on our jackets… and then a few minutes later we’d have to stop and remove our cold-weather gear because we were getting too hot. 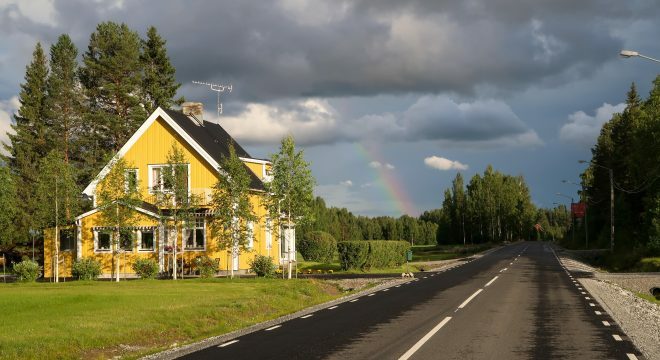 Now traveling north from Kåge to Piteå, we began following the E4 highway up the northern coast of Sweden. But instead of traveling on the E4 itself, we spent the entire day cycling on side-roads. 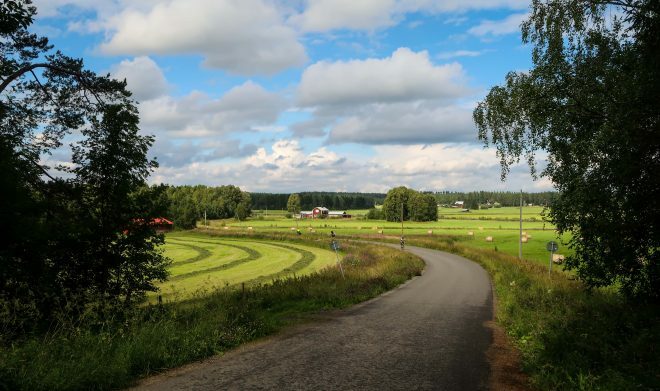 These side-roads sometimes had us cycling parallel to the E4, but most of the time these side-roads had us passing through scenic farmland, crossing through small villages, and sometimes going in and out of beautiful green forests. 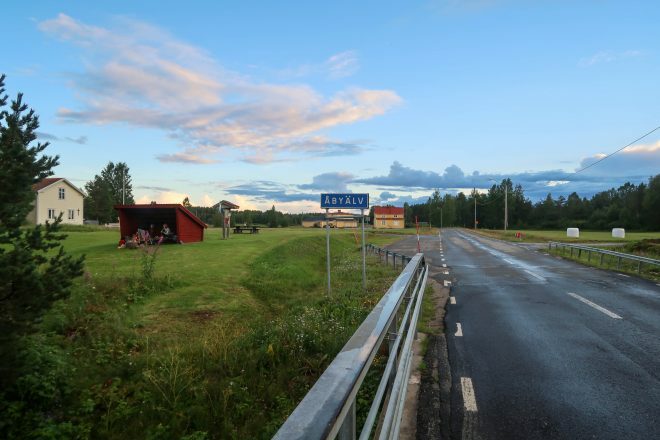 In the tiny town of Byske, we stopped to load up on food and run some other necessary errands. Line and I sat ate a picnic table, eating ice cream, while Rob and Doug attended to their shopping. 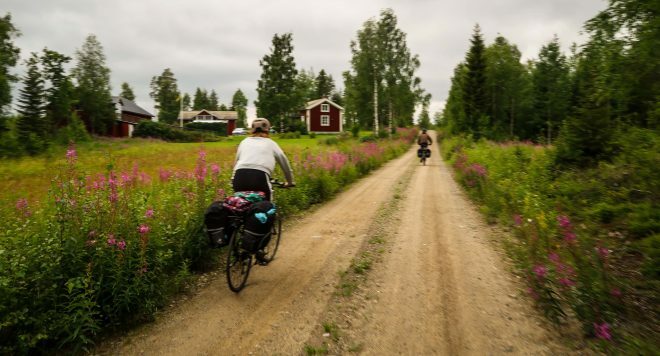 Then we cycled north out of town and began looking for a place to spend the evening. 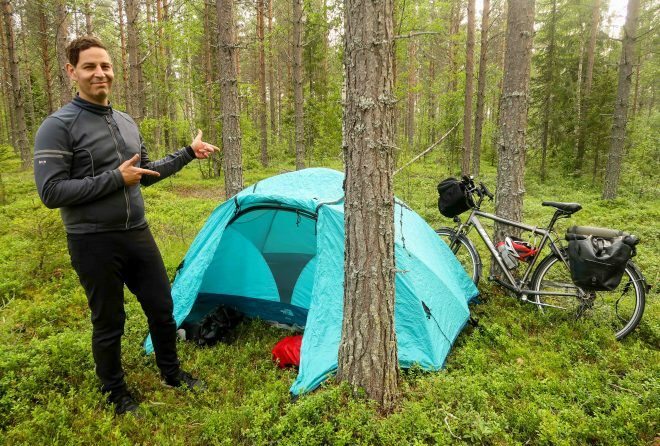 Rob had spotted a shelter on his map, which he said was just 15 kilometers away. But we accidentally cycled down the wrong road and ended up going an extra 10-15 kilometers out of our way. Then… it started raining! For about five minutes, the rain came down hard and soaked us all. 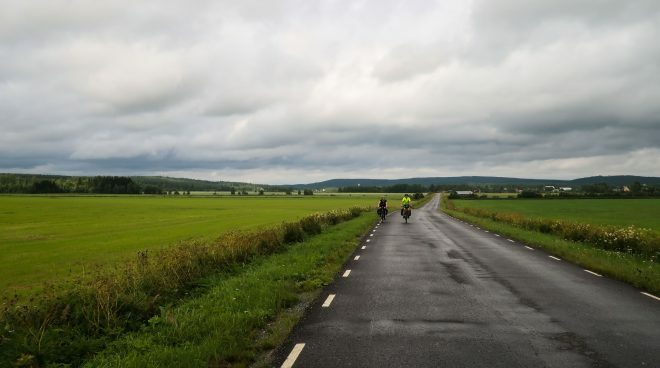 Some of us stopped in time to put our rain jackets on before the rain became too bad, but some of us (like Line) just cycled through the heavy rain without a jacket of any kind. A few minutes after the rain stopped, a rainbow appeared in the distance. We ended up cycling almost 90 kilometers on this particular day, and I personally felt great at the end of the ride. We hadn’t planned to go that far, but the road was so smooth and easy to cycle on that it made the kilometers click by super fast. Eventually, we made it to one of the shelters Rob had been looking at on his map. 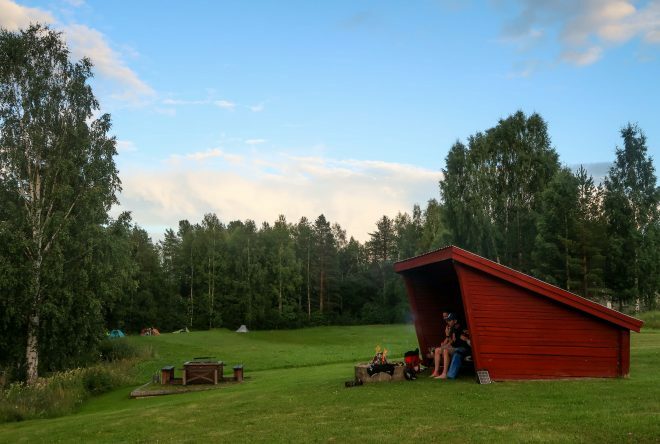 In the tiny town of Åbyälv we pitched our tents in the grass on the edge of the nearby river and then made a campfire in the shelter just a short distance away. 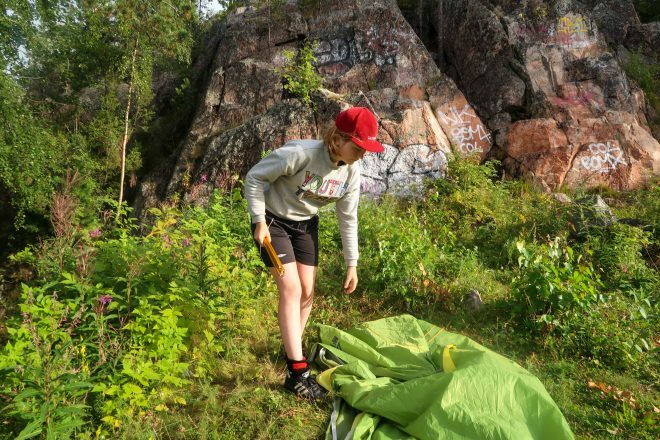 After Mikael had showed us that amazing shelter/campsite the night before, we began looking for similar places each and every night of our tour. 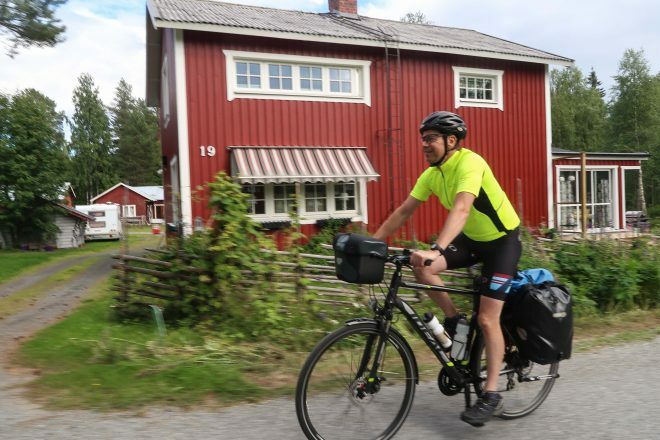 Luckily, there are shelters like this all across Sweden, and if you use a free map software, like Maps.me or even Google Maps, it’s very easy to find these shelters when you’re traveling by bike. From out shelter we were able to not only see our campfire, but we were also able to look out on the river that sat directly in front of us. 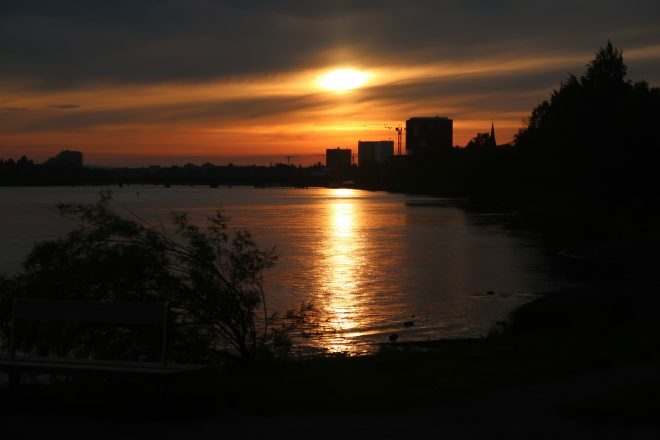 On one side of the river we had this spectacular view (pictured below). And on the other wide of the river we had this scenic view (pictured below). 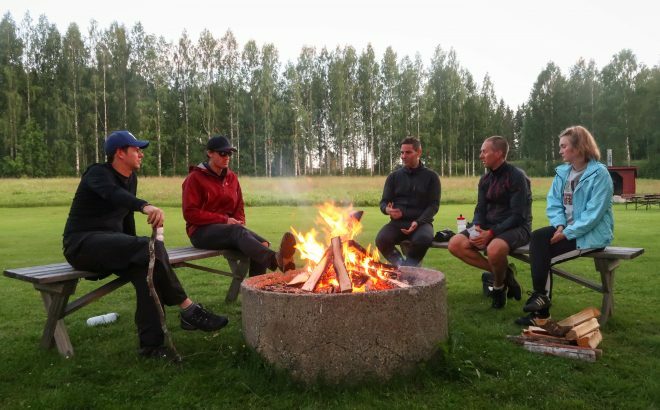 We spent the entire evening huddled together inside the shelter, telling stories around the campfire and discussing the highlights from our trip thus far. 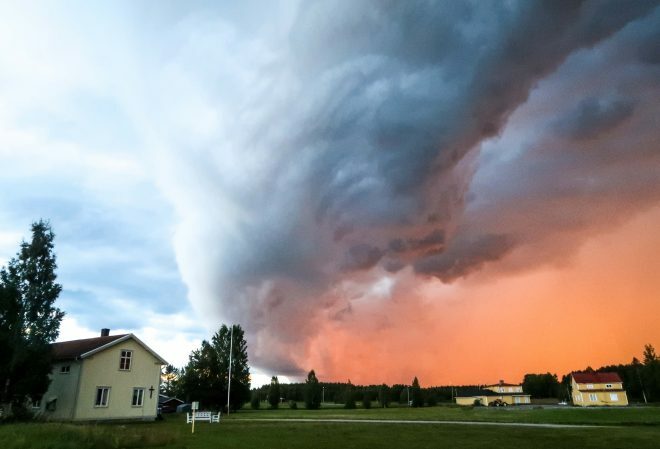 Sometime in the evening we noticed a giant orange cloud forming overhead and we knew that a massive storm was headed our way. 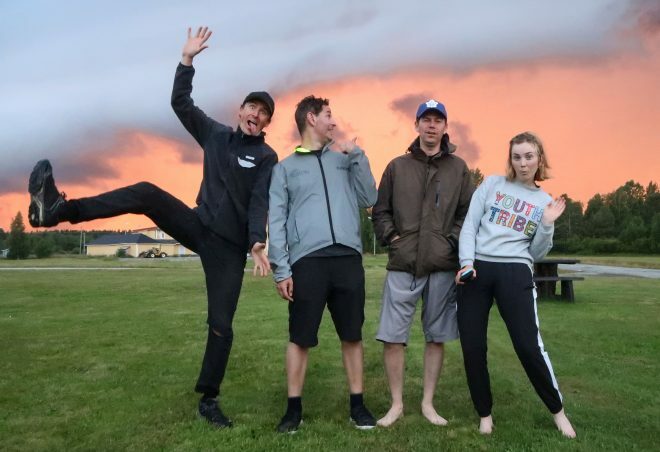 As the orange cloud quickly approached, we snapped a silly photo of the four of us and then ran back to the shelter to shield ourselves from the rain. It began pouring down rain, the wind was blowing wildly and we had a good old time running about, laughing and being out in nature. It was a wild, crazy storm, and we were all very happy to be safe and dry inside our free shelter on the side of the road. We stayed inside the shelter until well after dark, when finally we decided to return to our tents and call it a night. Line ended up sleeping in her tent under the shelter itself (in order to prevent any additional rain from coming into her tent), while Rob and Doug and I slept in our tents in the nearby field. By the time I woke up the following morning, Line was all packed and ready to go. She, apparently, had been awake for hours! But the rest of us were seriously lagging. 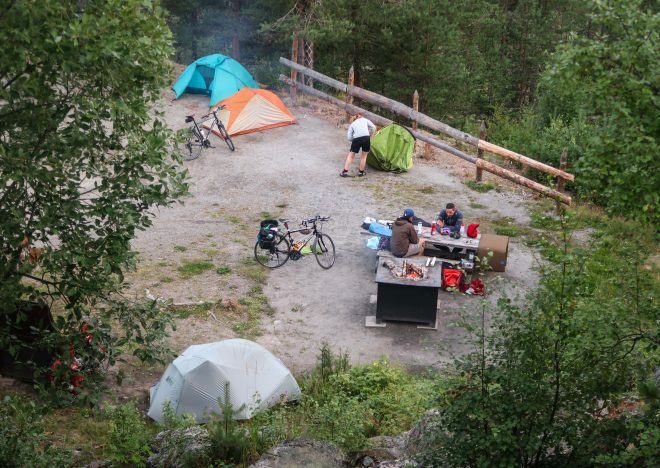 We did manage to eventually pack up our bicycles and leave our campsite behind. 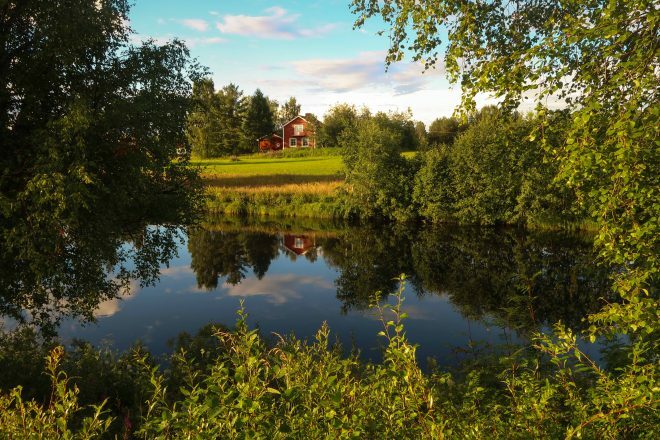 From where we were it was only a short bike ride into the nearby city of Piteå. We didn’t do much in Piteå. We bikes along the waterfront, walked through the city center, stocked up on food and water, and then cycled north out of town. 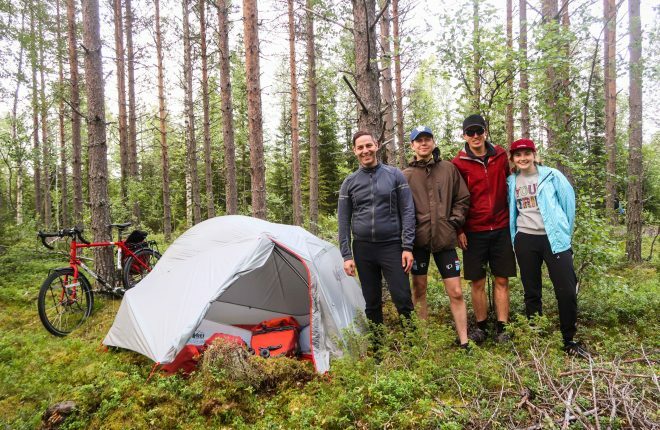 There was another shelter on our map, but it was located a few kilometers outside the city center, so we made our way there, following a network of bike paths and small forest side-roads until we arrived at our campsite for the evening. This particular shelter turned out to be the best one yet! Not only was there a small shelter stocked with more firewood than would be possible to go through in an entire month, but there were toilets a man-made lake, an outdoor theater and a number of other small buildings. 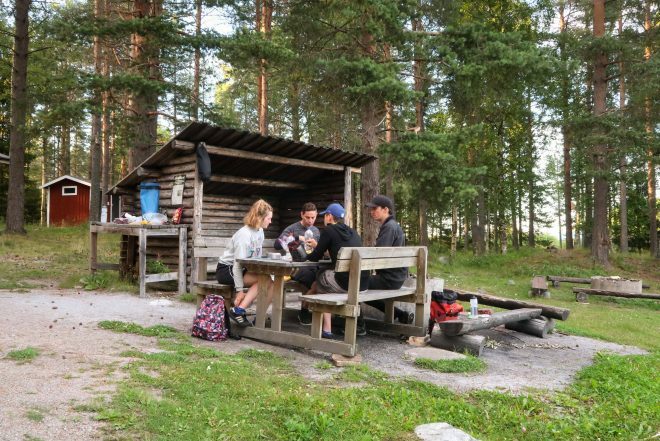 We ended up pitching our tents near the toilets and firewood storage house, and then made ourselves comfortable at the one and only picnic table in the area. We ate dinner and then, as we had done the two previous nights, sat around the campfire. It was raining when we woke up the following morning, so we stayed inside our tents until the rain stopped and then emerged at some time around noon. 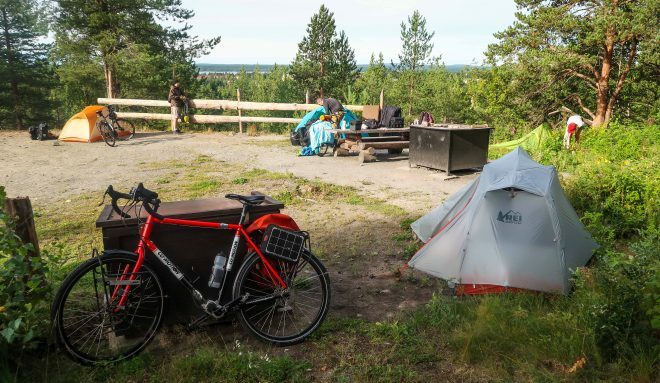 We ate a late breakfast around the picnic table and then packed up our bicycles and mentally prepared for our final full day of cycling on our northern Sweden bike tour. 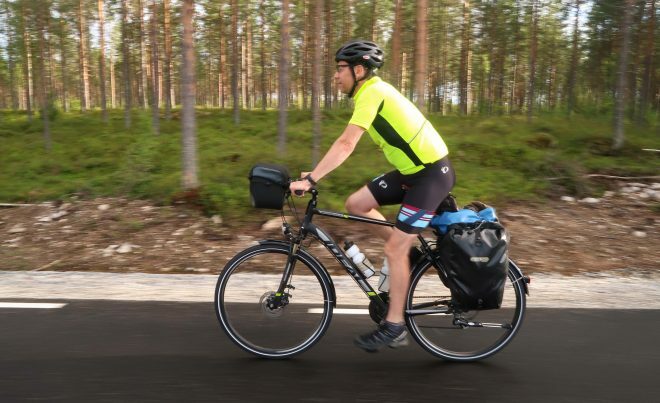 It was a short 50 kilometers or so from our campsite outside the city of Piteå to the nearby city of Luleå. 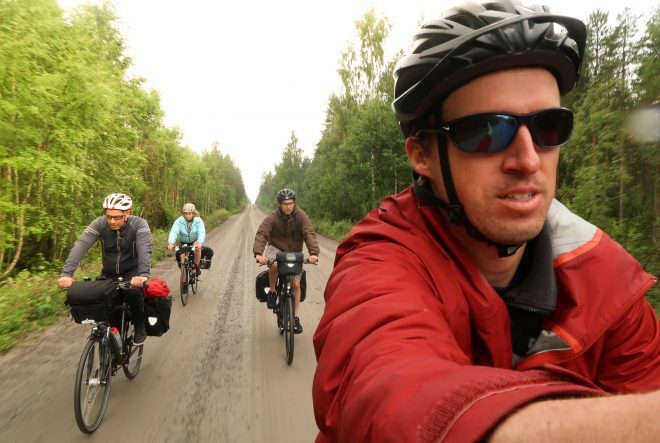 We cycled on dirt roads that passed through the forest, and sparsely-traveled paved roads that passed through several small villages. When we arrived in Luleå, we were welcomed by a long, iconic bridge, that led us from the south side of the city to the center. Crossing over the water and then stepping into the city center was a great way to finish our bicycle touring adventure! 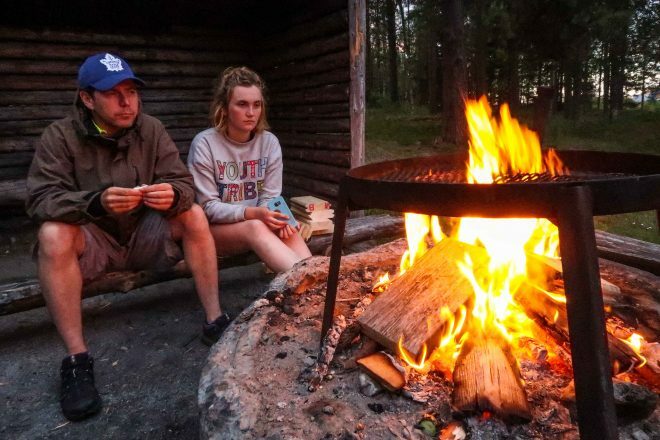 We tried looking for a campsite or shelter in the city center, but there was nothing to be found, so we cycled about 4 kilometers to the north of town and found an area, up on the top of a small hill, where we could camp for the night and have one last fire. As we had done the nights before, we sat around the picnic table, ate dinner, made a fire and enjoyed each-other’s company. 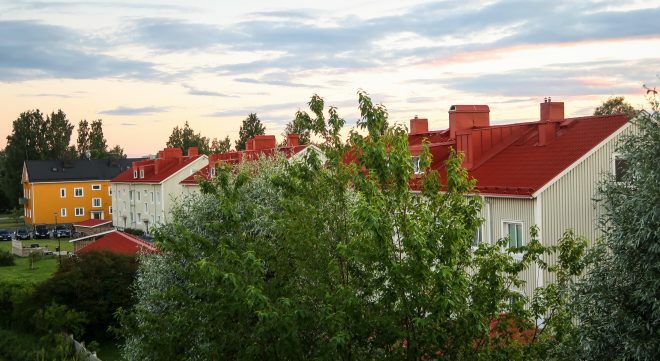 In the evening, just as the sun was about to set, we climbed the hill overlooking our campsite and looked down on the city Luleå. From this vantage point we could see the entire city! We woke up early the following morning and quickly packed up our things. 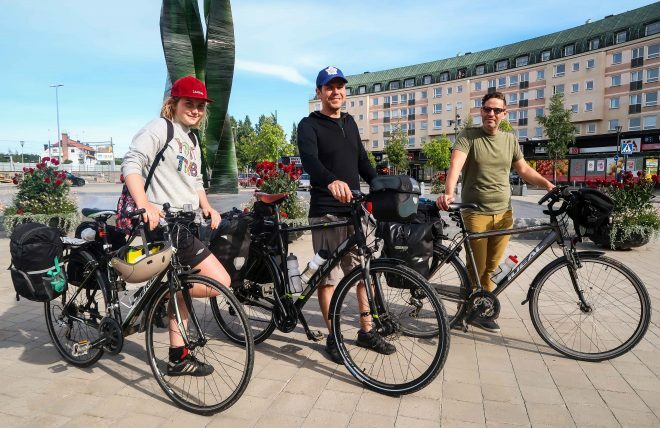 While we had been slow to start on pretty much every previous day of our bike tour, we needed to get going quickly on this particular day, because we planned to get on a bus that left the Luleå bus station around 10:00 AM and travel with the bus back to Umeå, Sweden – where our bike tour began. 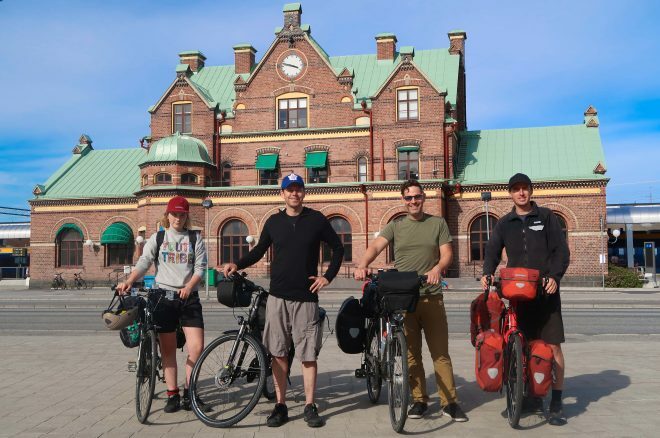 Luckily, we made it to the Luleå bus station in time, and getting all four of our bicycles on-board wasn’t a problem. The bus had a big storage area in the back where they were able to put all four of our bicycles, along with a number of other commercial products the bus company was transporting across the country. 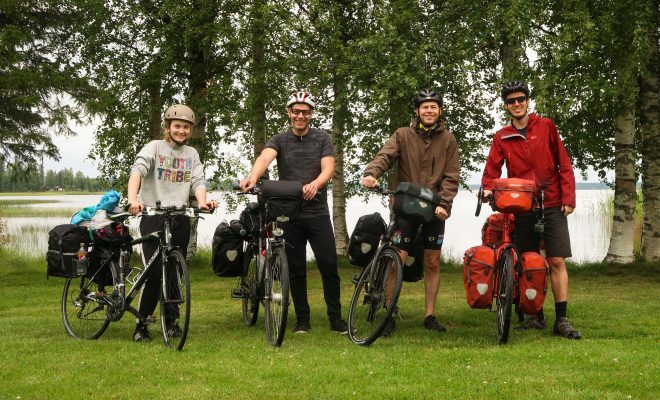 When we arrived back in Umeå, we snapped a few photos of our group. From left to right (on the photo above), that’s Line Gammelli, Doug Ireland, Rob LoRusso and me (Darren Alff). 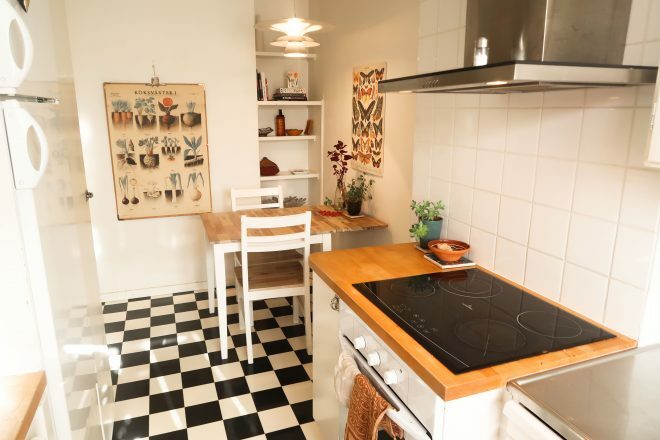 For the final nights of our northern Sweden bike tour, I rented an apartment in Umeå using AirBNB.com. The owner of that apartment had his mother meet me at the bus station and give me the key. Then, with the key in hand, the four of us cycled across the city to our home for the evening. 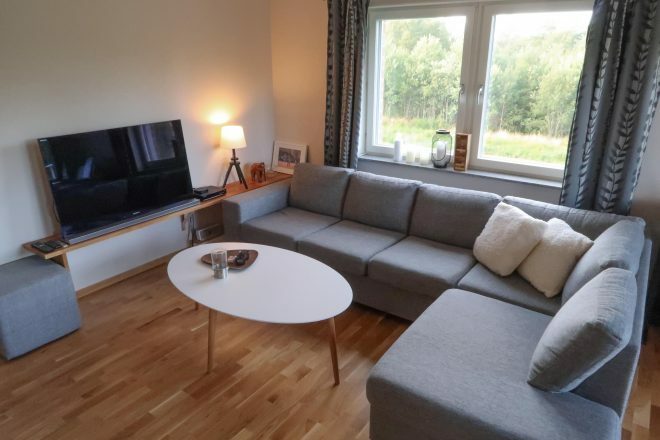 The AirBNB apartment I rented was located far from the city center, so we had to cycle for several kilometers south along the river’s edge to the Gimonäs area of Umeå. It was here that we found our apartment for the night located in a practically brand new 6-story building. 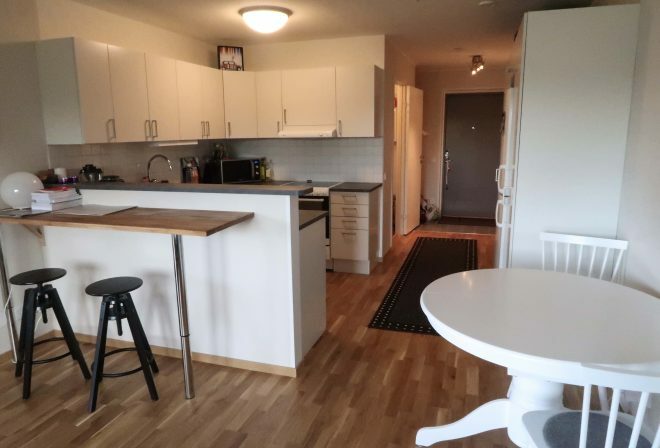 The apartment was straight out of an IKEA catalog! 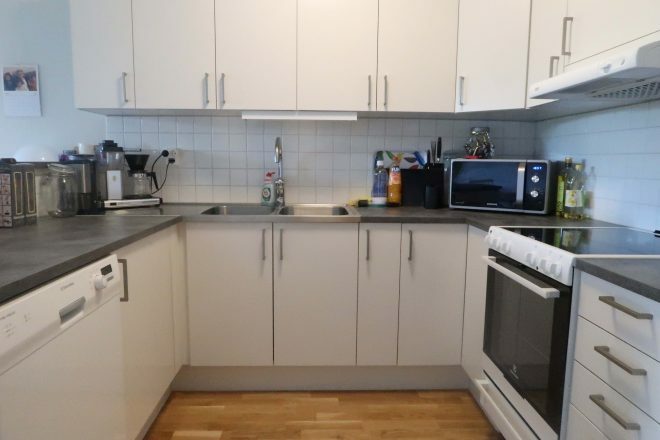 It had a kitchen, living room, bathroom, bedroom, and a small balcony. Rob and Doug slept in the living room, I slept on the kitchen floor, and Line slept in the bedroom. 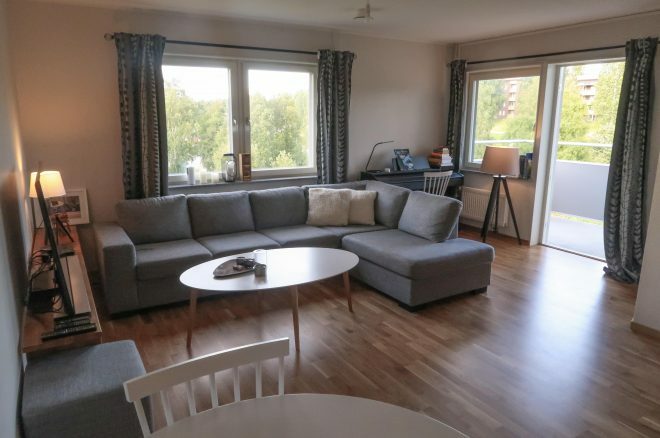 My favorite part of the apartment was a large sofa. Sitting there and relaxing was so incredibly comfortable. Line ending up staying at the apartment for just one night. Rob and Doug stayed for two nights, and then I stayed in the apartment by myself for the following week – at which time, I flew back to California. 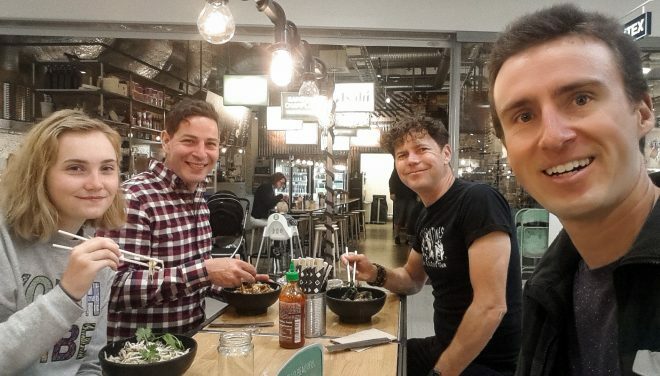 During our last night in Umeå together, Rob, Doug and Line and I cycled across town to the IKEA shopping center and ate dinner at an Asian restaurant called SEN Street Market. The food was really good! And after a week of eating mostly sandwiches and chocolate bars, we were all happy to have some real food in our stomachs. 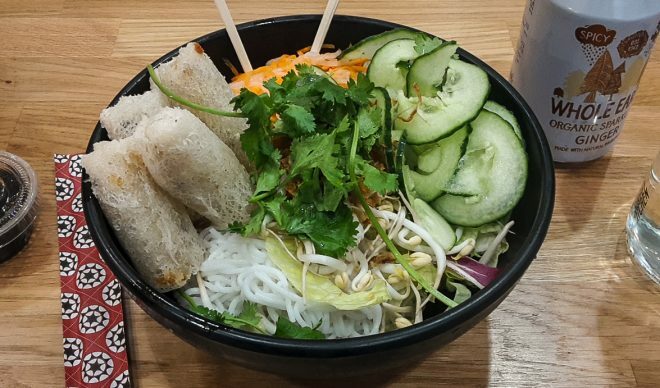 They even had a couple vegetarian options! The following day, Rob and Doug returned their bicycles to the bike shop. 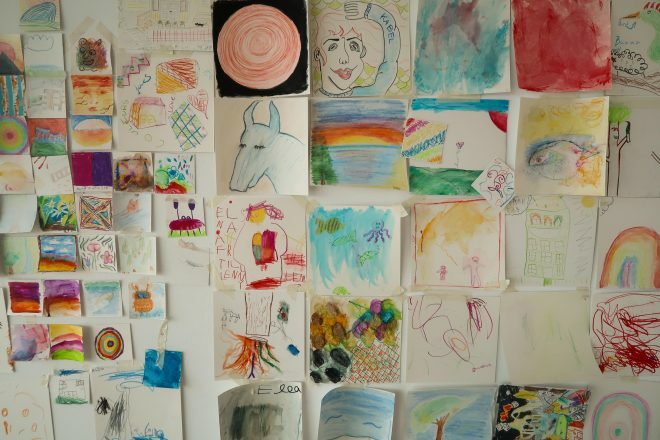 My favorite part of the museum was the gift shop and a small area where they asked local children to draw on scraps of square paper. 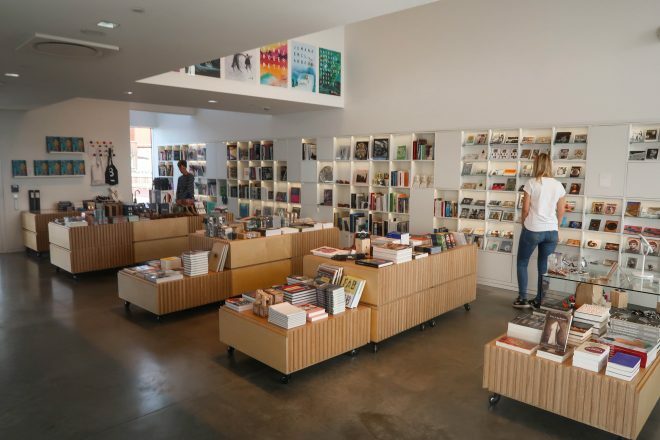 When we’d had enough of the art museum, we wandered back to the city center and said goodbye to Line. I followed line to the train station, hugged her goodbye and told he what a good job she had done on the tour. 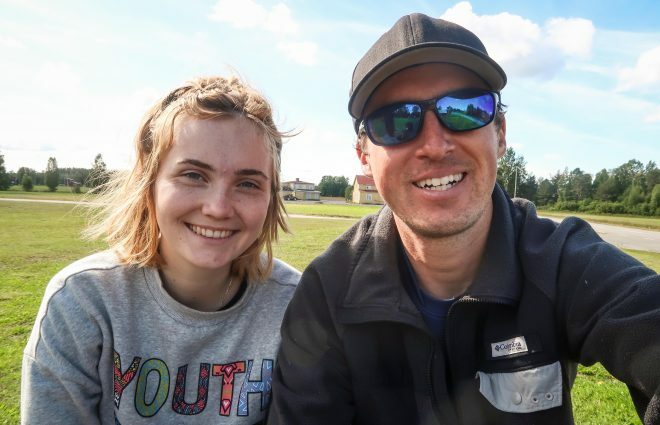 She really was a joy to travel with and I’d be happy to do another bike tour with her in the future. The following day, Rob and Doug jumped in a taxi and traveled back to the airport. Doug flew back home to Canada and Rob stayed in Europe for a few more days – visiting some friends in nearby Norway before he too returned to his home in London, Ontario, Canada. 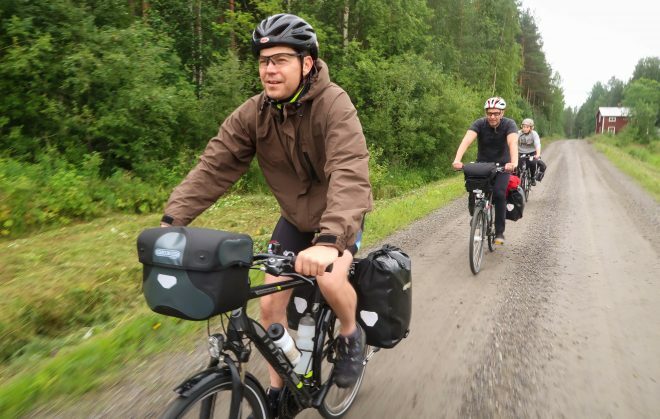 Our week-long bike tour in northern Sweden was a good one! 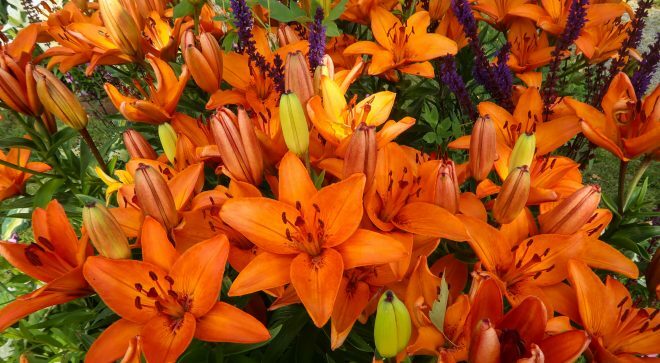 I enjoyed each and every day… and I enjoyed the people I was cycling with. Rob, Doug and Line and I got along so well that we’re already discussing the possibility of doing another bike tour together at some point in the future. How cool would that be!?! 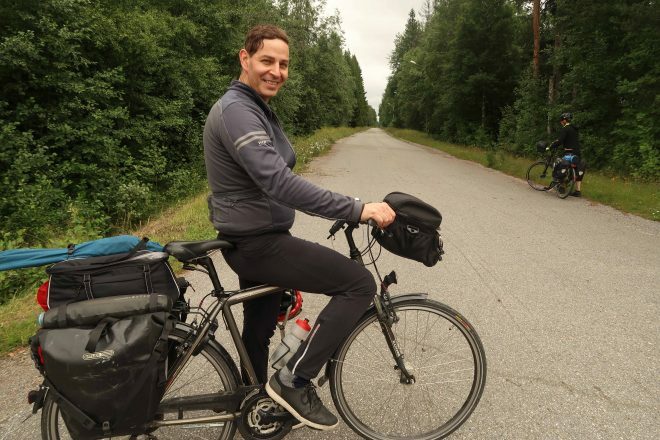 Click play on the podcast player above to listen to me talk about our 2017 summertime bike tour across northern Sweden. 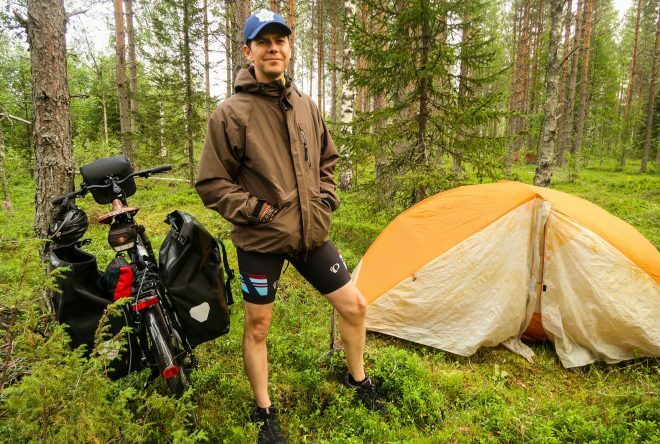 This entry was posted in Bicycle Touring Pro Articles, Darren Alff's Bike Tour Blog, Featured Articles, Main Articles, Main Featured Articles, Photos, Podcast, Sweden, Uncategorized and tagged bicycle touring gang, bicycle touring pro, bicycle touring squad, bike tour, bike tour photos, darren alff, Doug Ireland, gang, group bike tour, Line Gammelli, Lulea, lulea sweden, northern sweden, Pitea, pitea sweden, rob lorusso, roberto lorusso, Skelleftea, skelleftea sweden, squad, sweden, umea, umea sweden, Vasterbotten. I see the REI Quarter Dome tent in your pictures. Is that your new tent? Do you have an estimate of how many nights you spent in the soon-to-be-retired(?) BA Copper Spur tent? ? I spent about a year in my old Big Agnes Copper Spur tent before getting a new tent. That is 1 year of sleeping in the tent.